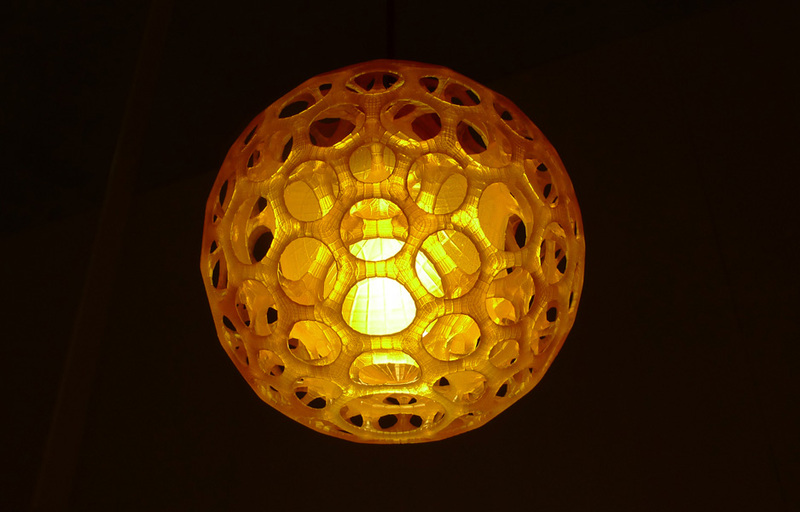 3D Printing Lighting Inspiration: Get Inspired by the Work of Others! 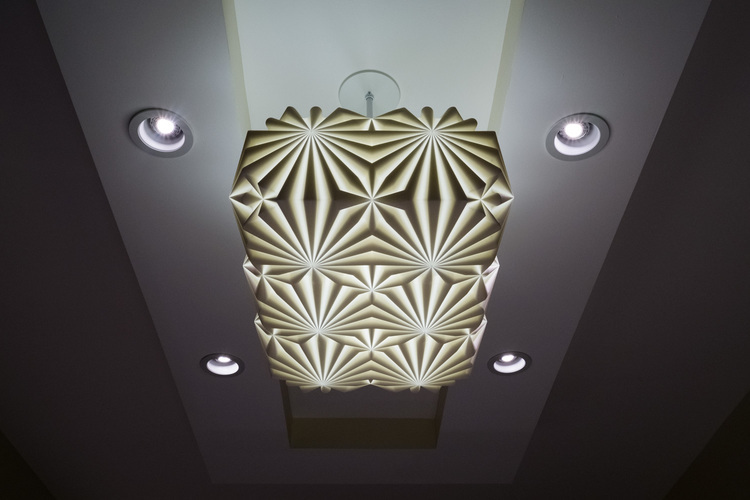 Here’s a portfolio featuring impressive lighting projects from around the globe that were fully or partially realized by using 3D printing technologies. 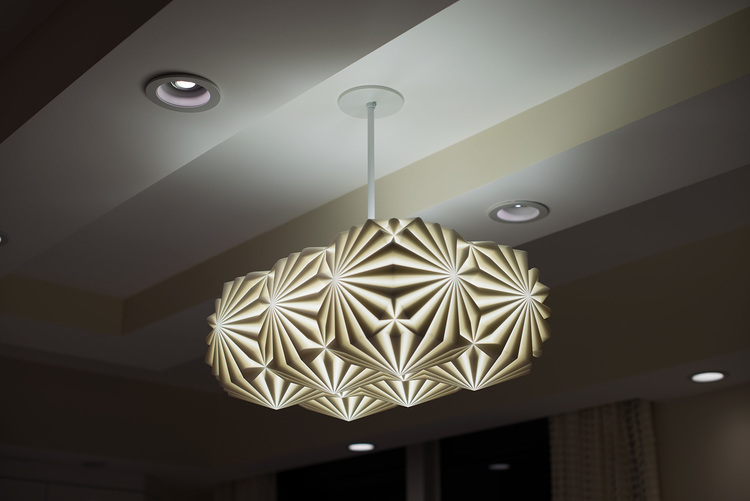 Learn how other lighting professionals successfully applied 3D printing to their engineering or design projects. 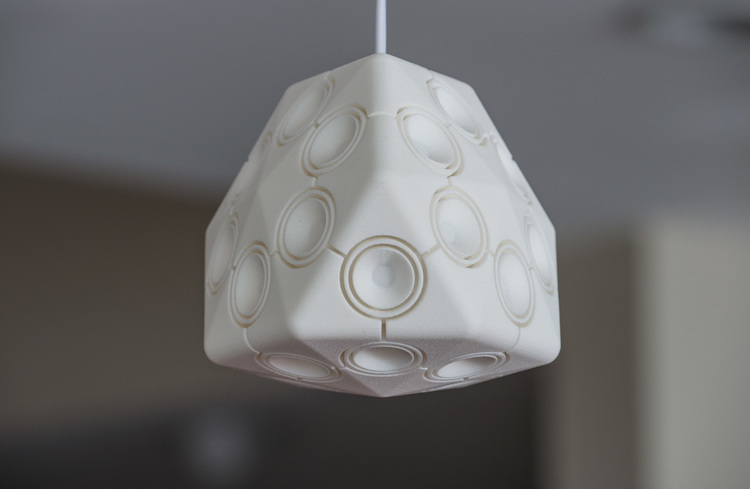 Want to see your own projects featured here and inspire others with your work? Please contact us to learn about the possibilities! 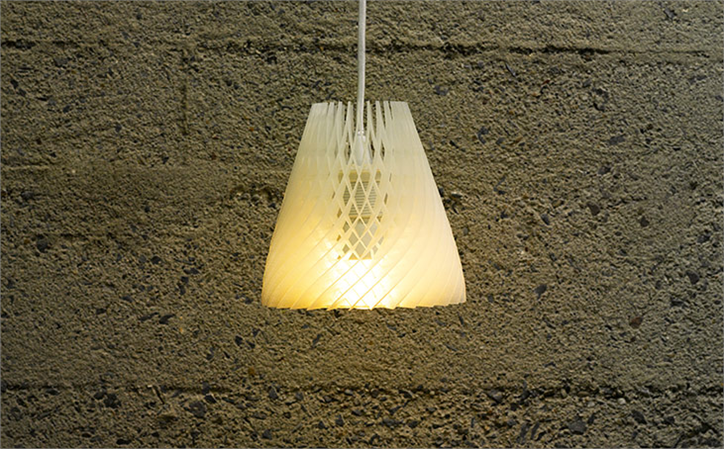 The 'Line' is a cylindrical 3D printed fixture from the Lacelamp portfolio by LPJ Studio. 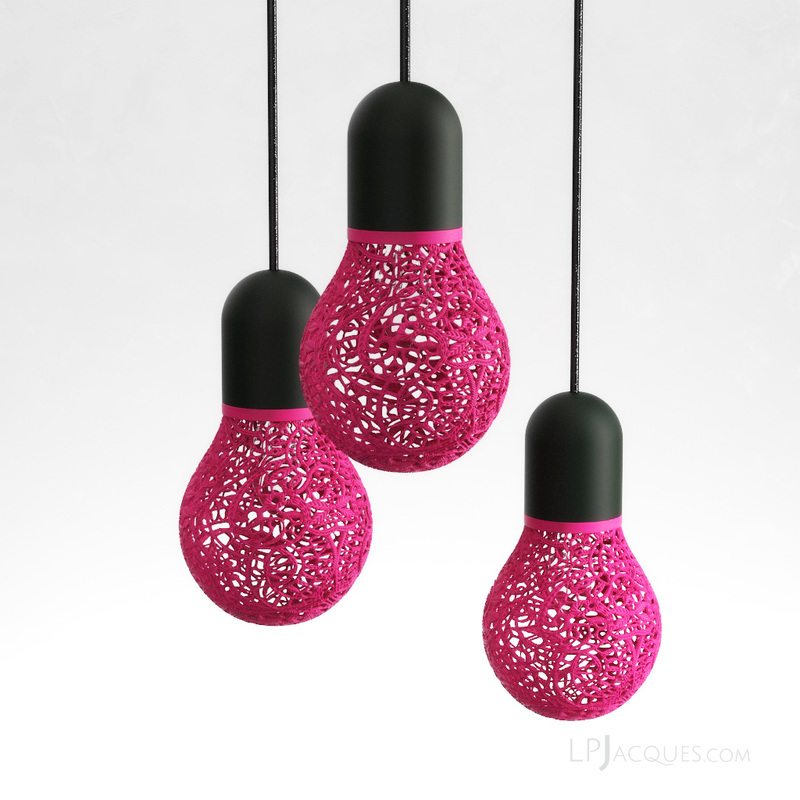 Available as pendant in a variety of colors to choose from! 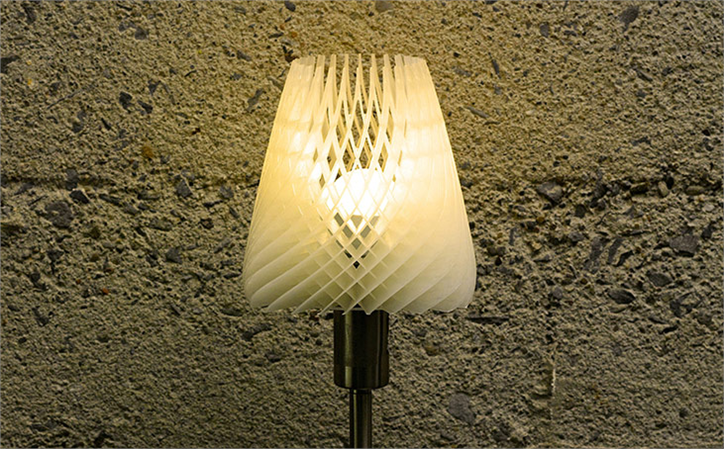 The Lacelamp 'Land Mini' is a stylish 3D printed fixture designed by Design Studio LPJ from Paris. 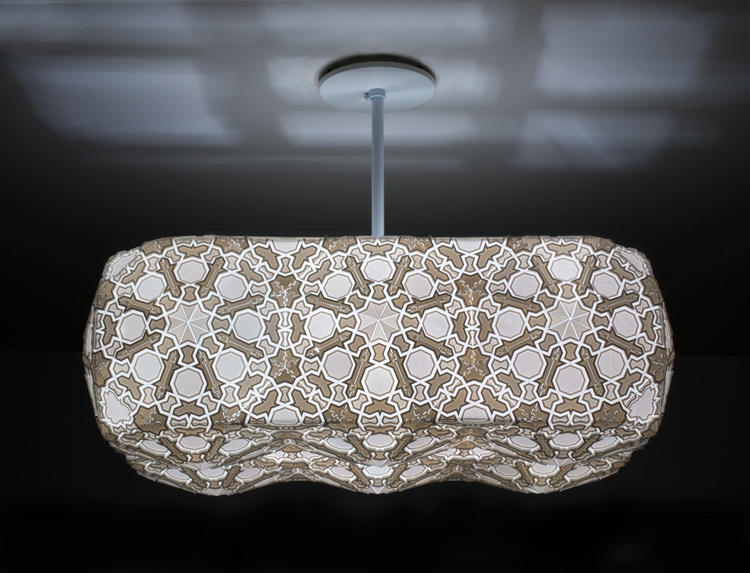 This elegant table fixture is available in a range of colors to make it fit to any interior! 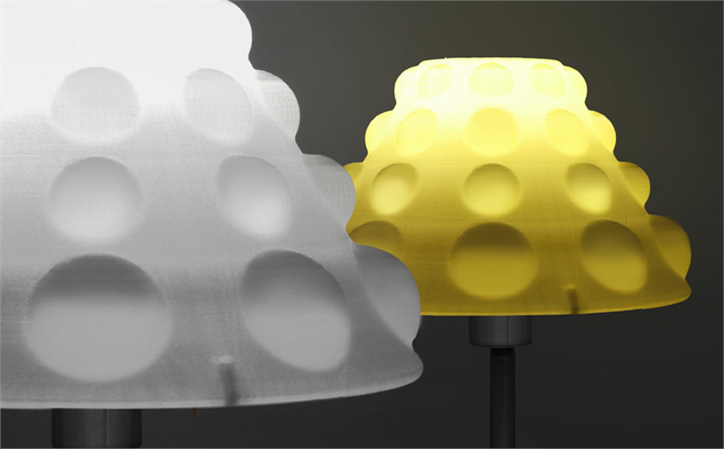 Lacelamps are a stylish 3D printed fixture range designed by Design Studio LPJ from Paris. 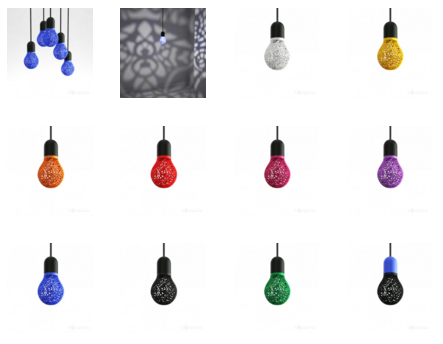 The 'Sky Mini' pendant comes in a variety of colors. 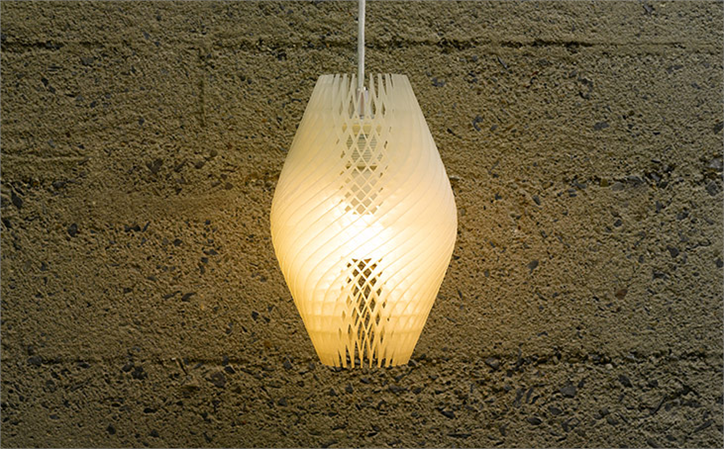 The Lacelamp is a 3D printed bulb fixture designed by Design Studio LPJ from Paris. 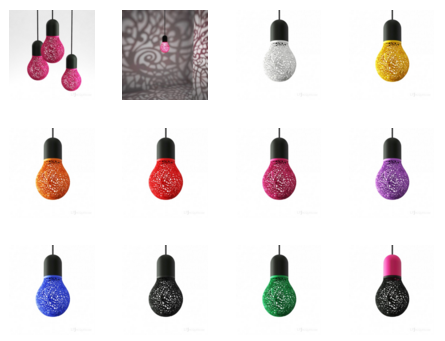 The 'Drop Medium' pendant comes in a variety of colors. 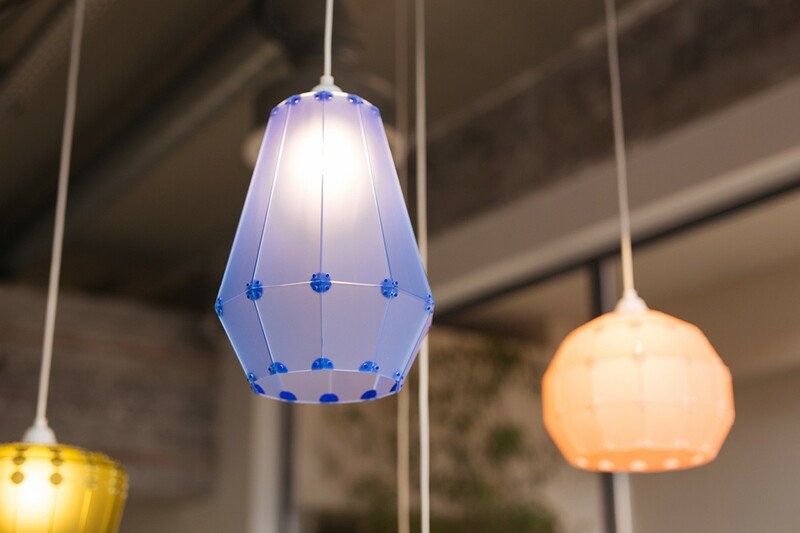 The Lacelamp is a 3D printed bulb fixture designed by Design Studio LPJ from Paris. 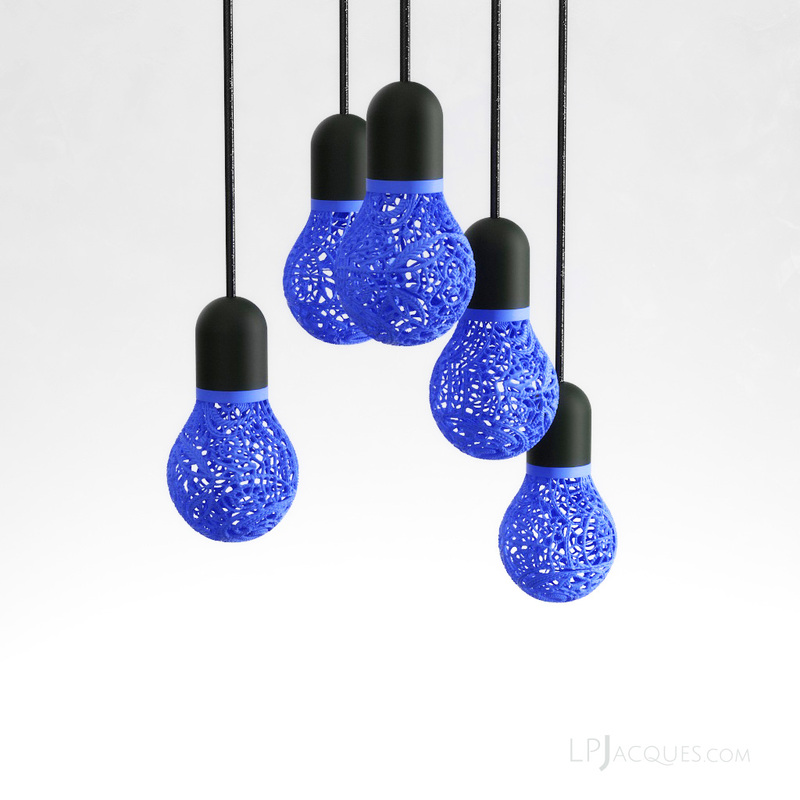 The ' Drop Small' pendant comes in a variety of colors. 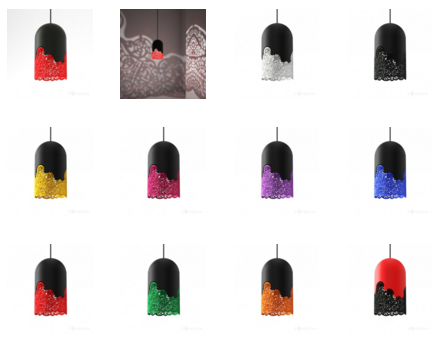 The 3D Printed Splash Lamp beautifully captures a moment of liquid art. 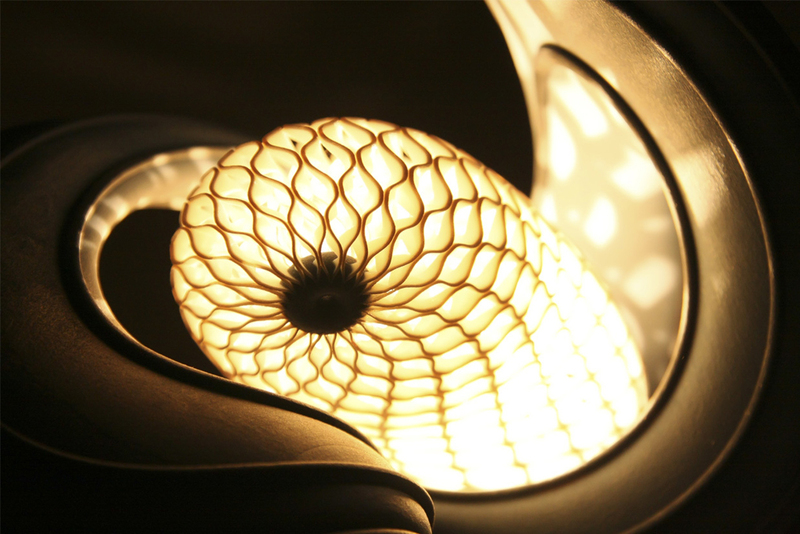 3D Printed Splash Lamp is inspired by a water drop picture taken with a high-speed camera. 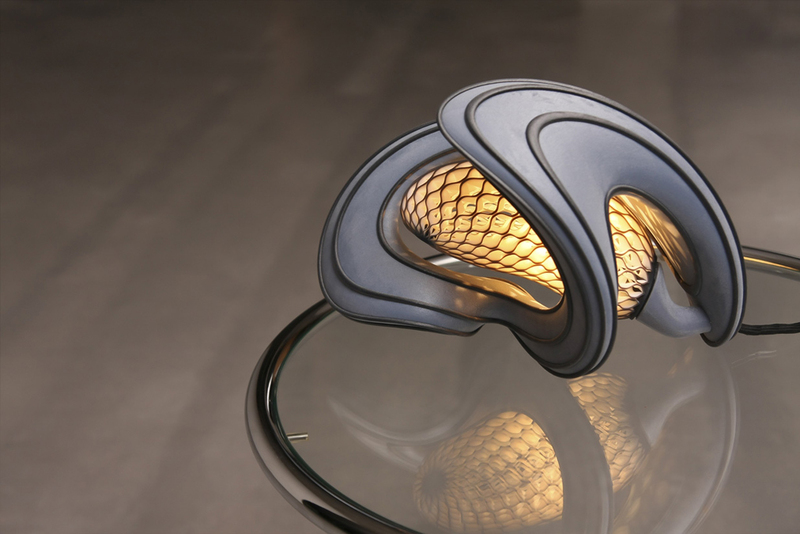 Desmond transformed the delicate fluid lines of the water surface into a large 3D Printable model. 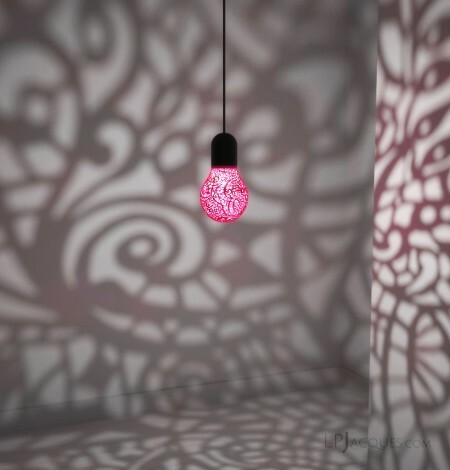 When a light bulb is installed, Splash Lamp sheds a gentle light through its semi-transparent shade. 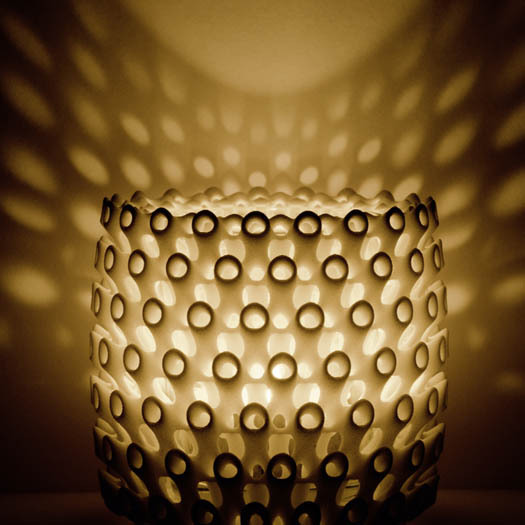 This unique glow is created by the transparent resin material used for printing. 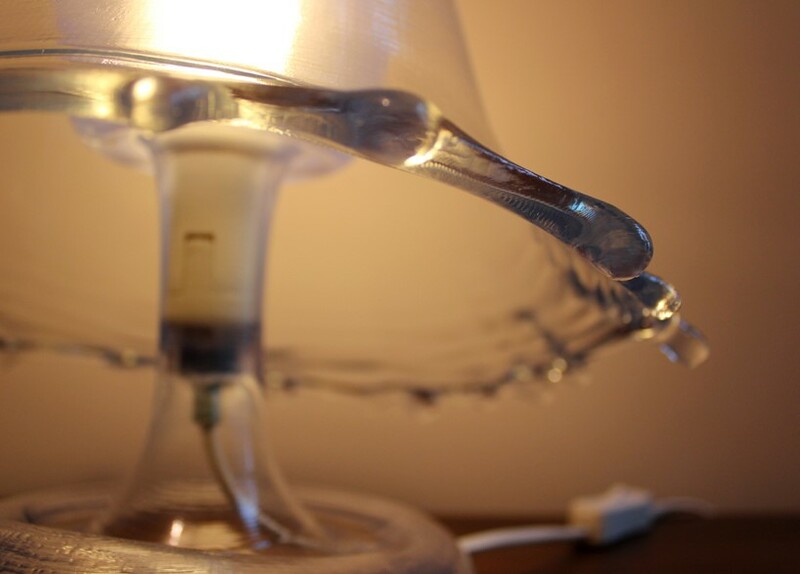 It is an unlikely material for a lamp; however, the smooth surface was the most suitable to portray the texture of water in motion. 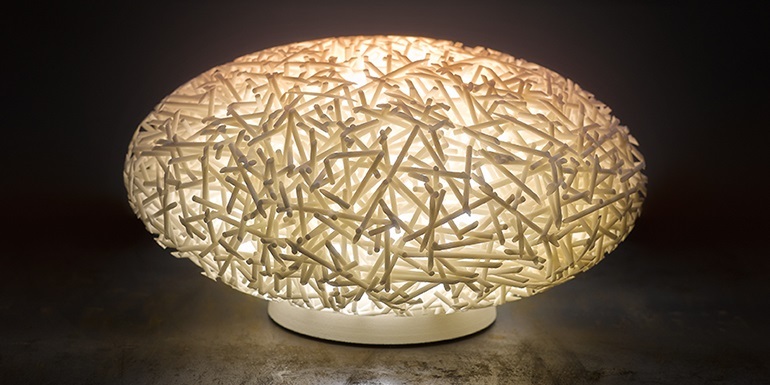 The Colony lamp was created with the express purpose of being a thing of intrigue and awe. 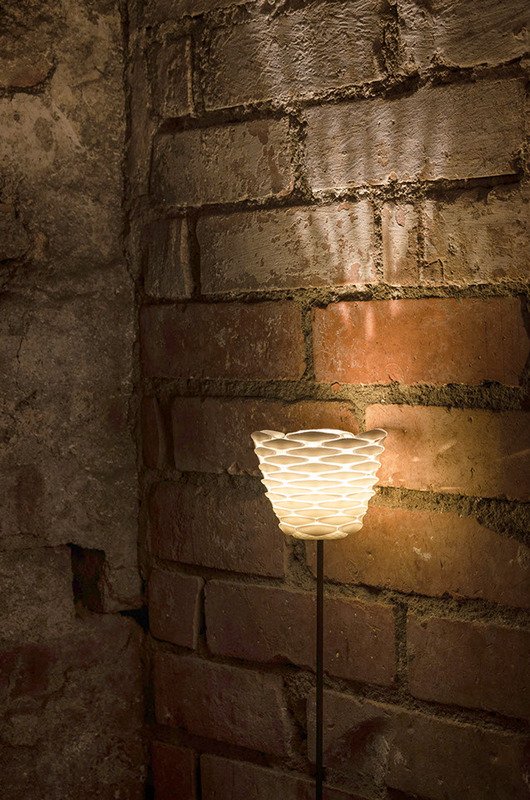 Whether the light inside remains on or off, the lamp’s exterior in itself is so mesmeric, you can’t get enough of it. 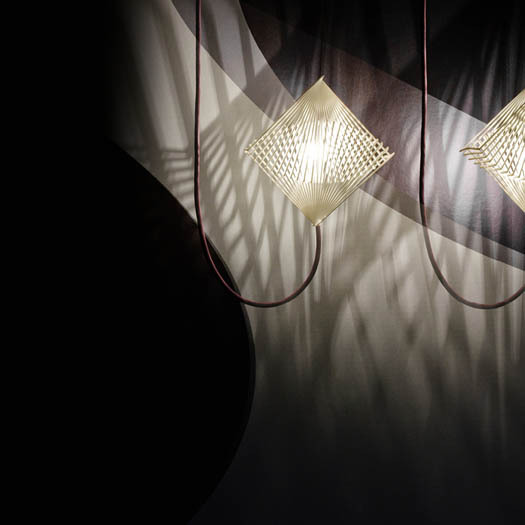 The lamp is designed to intrigue, evoke emotion and complement the space it inhabits. 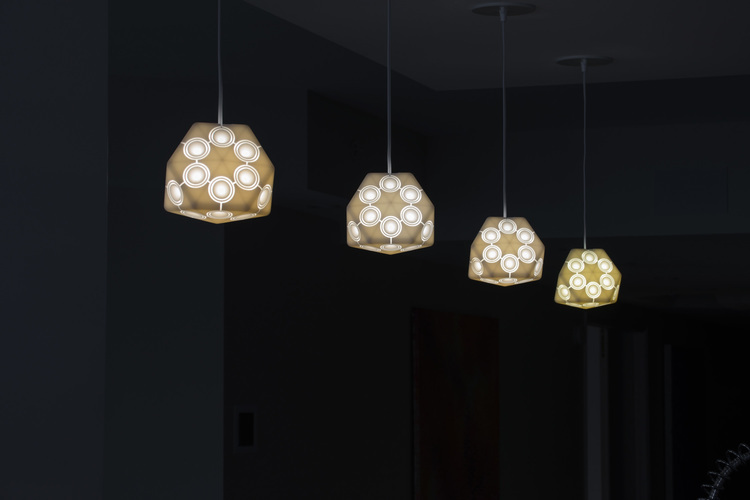 Illuminate your space with an iconic piece from the Freshfiber lighting collection. 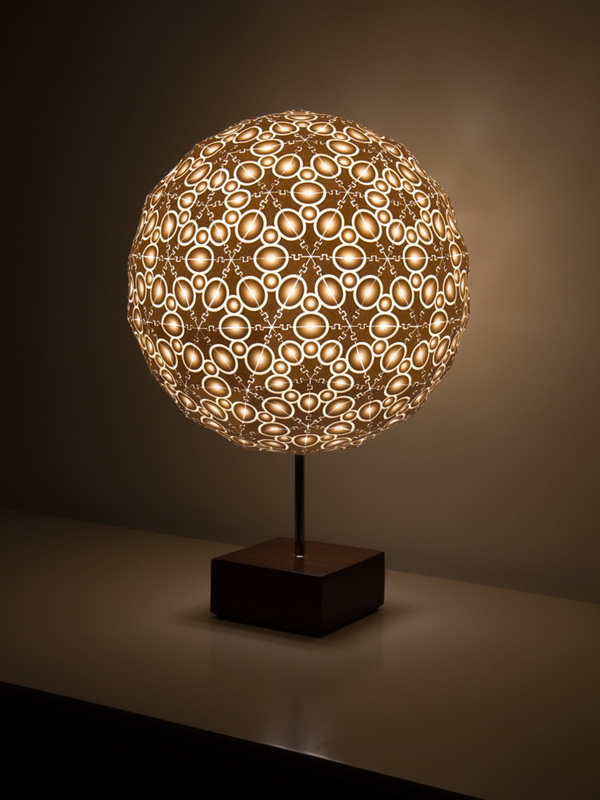 Choose from table and standing lamps, wall and ceiling lights. 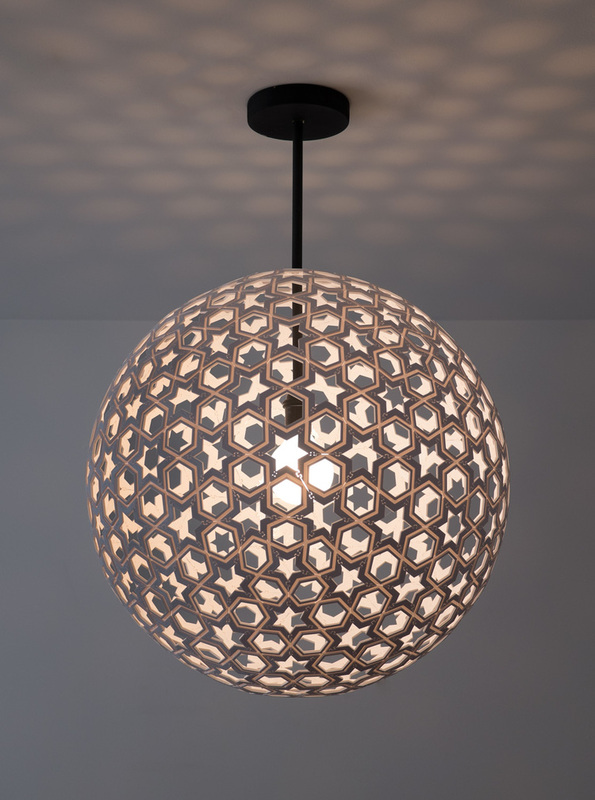 The intricate designs shape light, adding atmosphere to any interior. 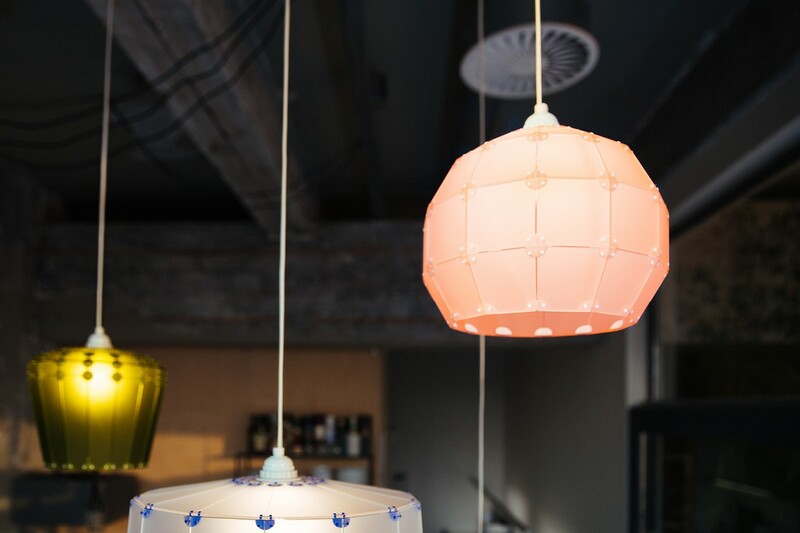 Forget flat, Bubble Lamps are where it’s at. 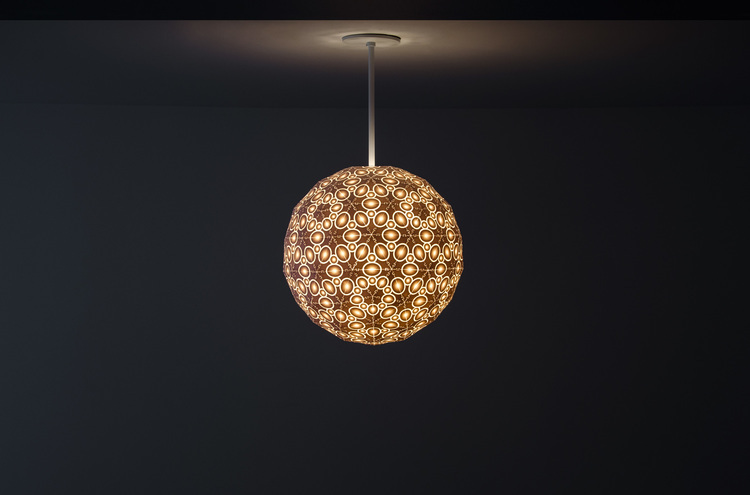 Spice up your space with the essentials of great interior design: texture, mood lighting and your own personal style. 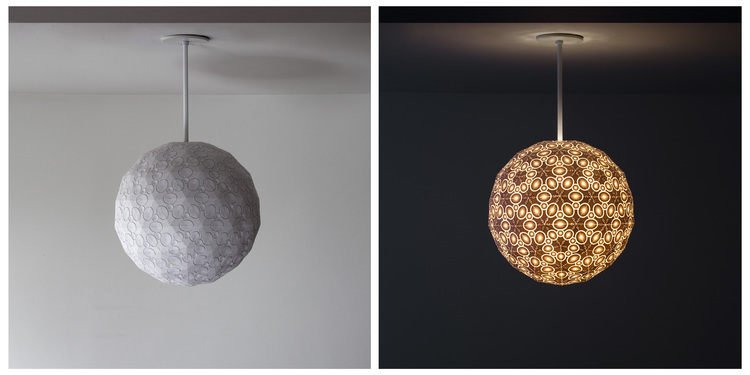 Lumì, lampshades made with laser cutting and 3D printing. 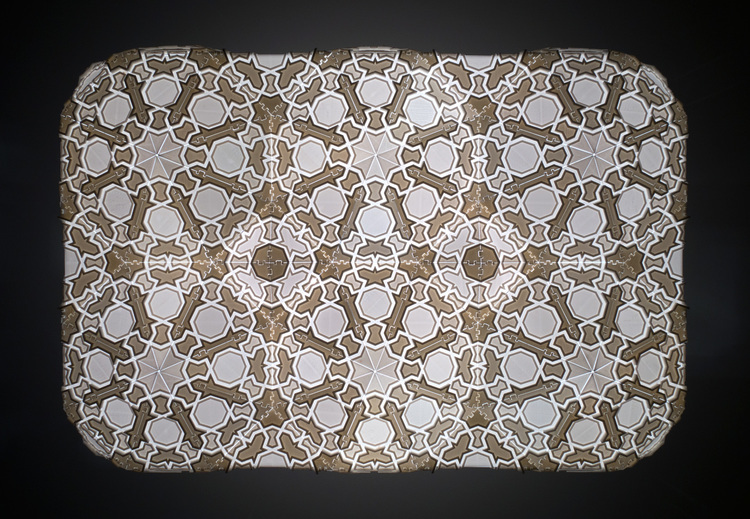 These techniques allow to make unique designs every single time. 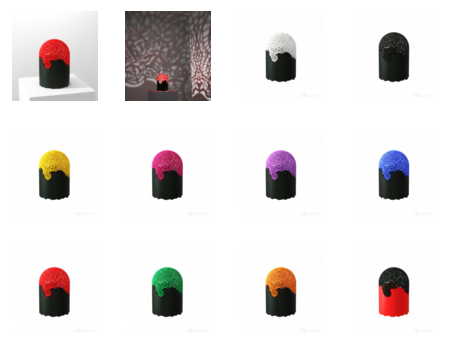 Choose your favourite model and personalised colors. 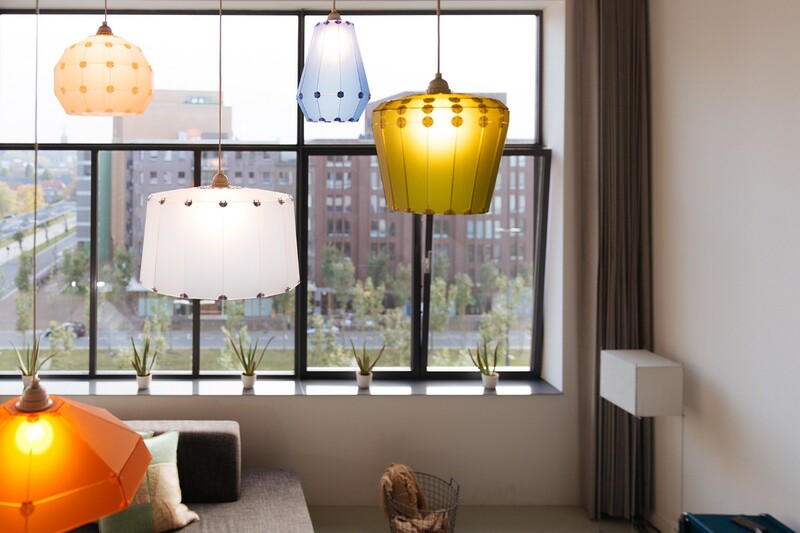 Designed and produced in Eindhoven, The Netherlands. 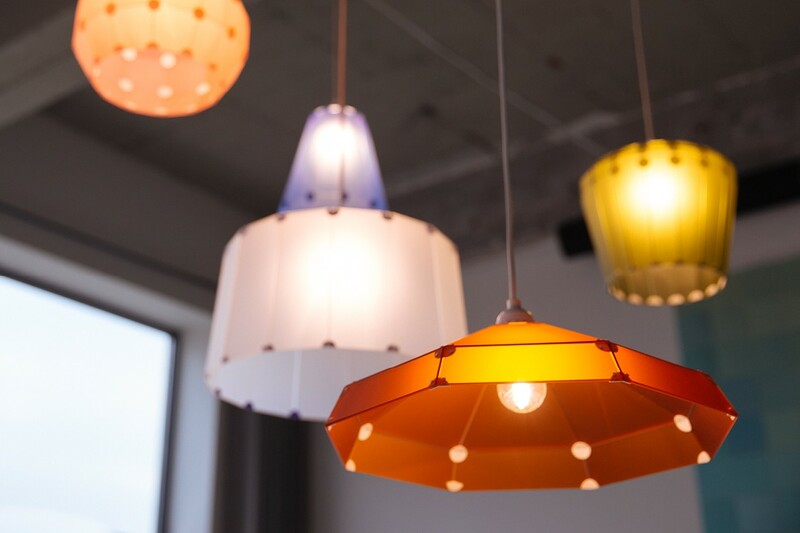 Elevate any space from basic to idyllic. 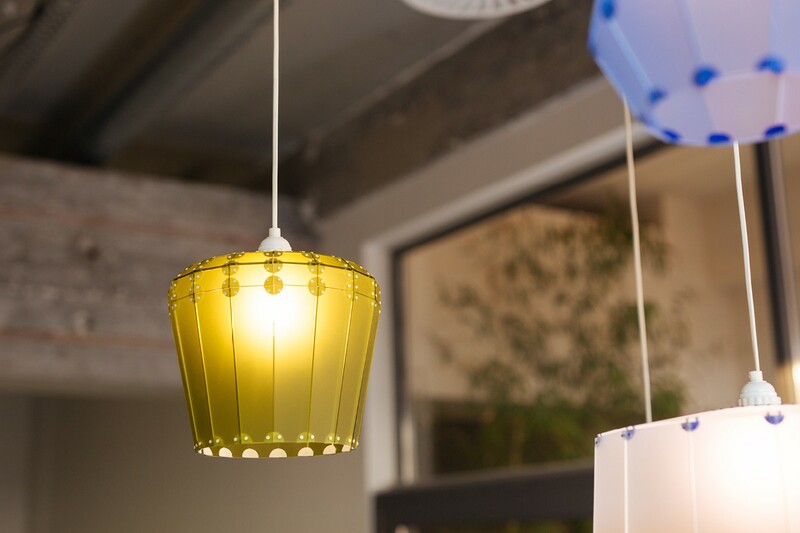 The easy, economical way to upgrade any space is lighting, so we made it even simpler–designing the series to fit mass market Swedish lamps. 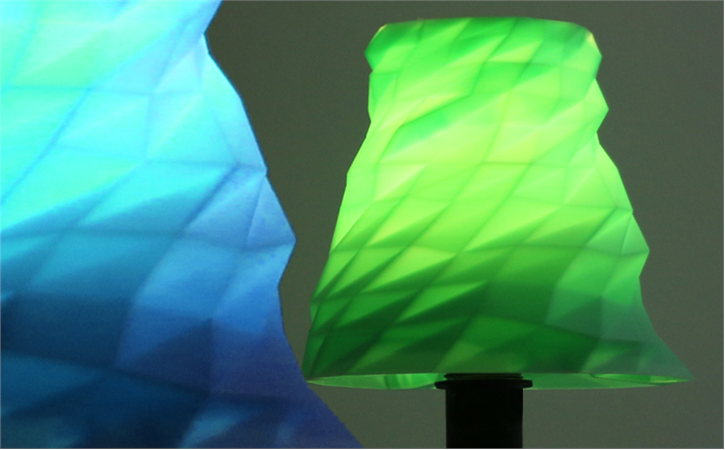 Innovative Twist lampshades you 3D print yourself. 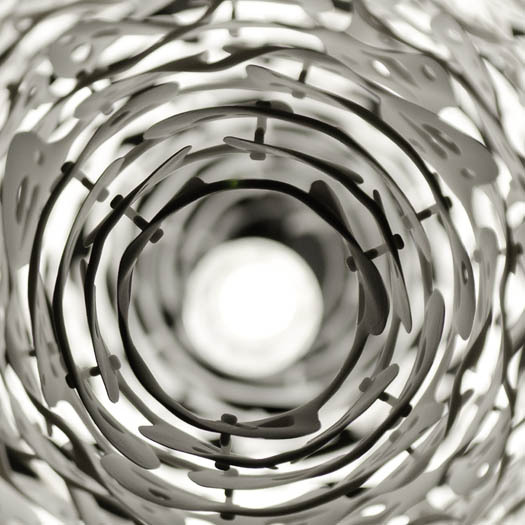 Twist wins the trifecta of great interior design: thoughtful detail, intriguing texture, and layers of localized light. 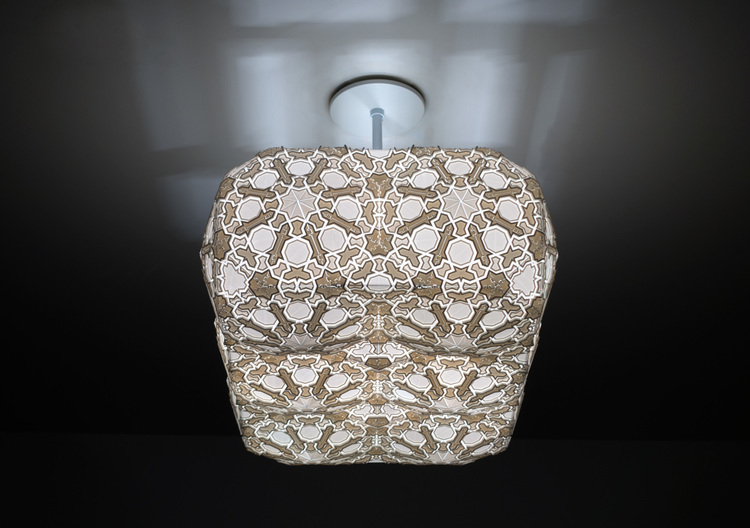 The Twist Lampshades are free to download and made to fit on the 3D Systems Cubify and Cubify Pro. • 22 x 16 x 10 in. 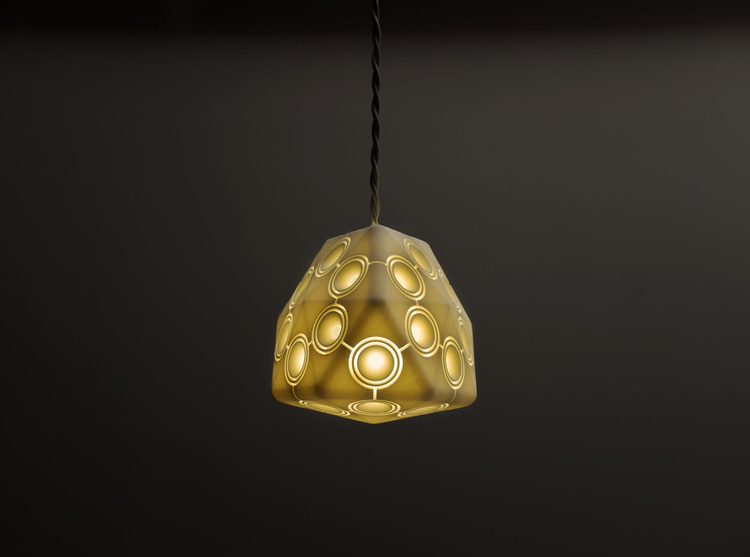 • UV-coated laser-sintered nylon • Canopy and stem available in powder- coated steel, brass, antique brass, polished nickel (length of stem can be customized to adjust drop from ceiling) • 2 Energy efficient LED bulbs • Fully dimmable The 'Zeppelin Chandelier' was created by Robert Debbane Studios, Brooklyn, NY. 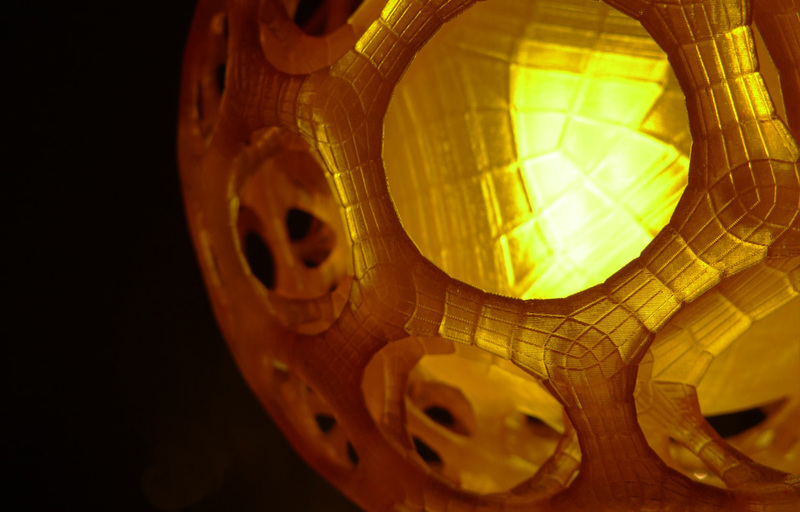 • UV-coated laser-sintered nylon • 23 x 16 x 14 in. 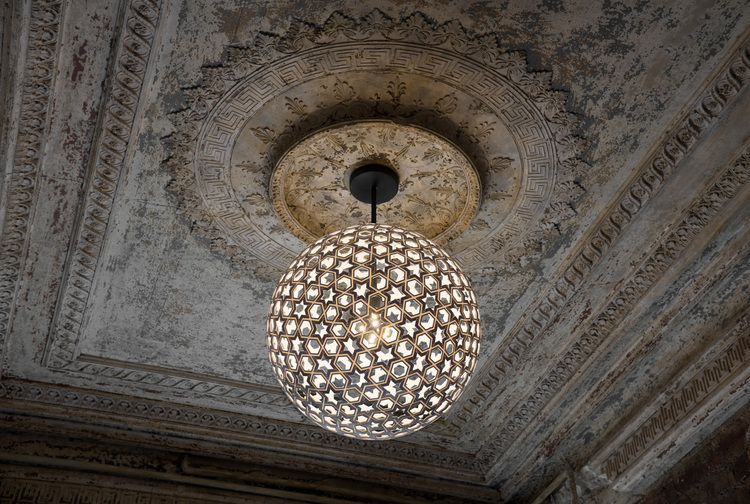 • Canopy and stem available in powder- coated steel, brass, antique brass, polished nickel (length of stem can be customized to adjust drop from ceiling) • Energy efficient LED bulb • Fully dimmable The 'Weathervane Chandelier' was created by Robert Debbane Studios, Brooklyn, NY. • 12-in. 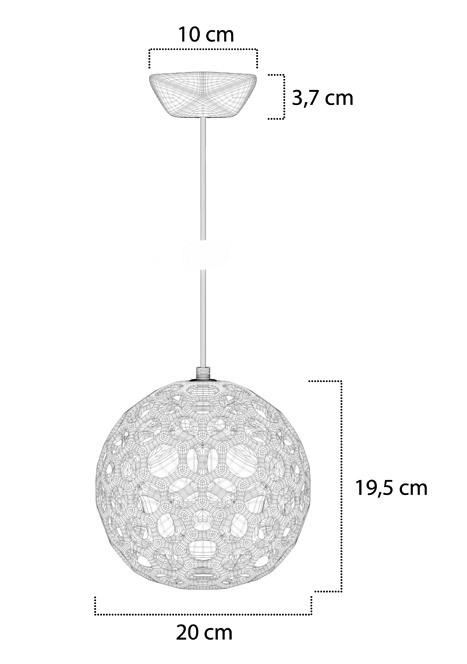 diameter, overall height 17-in. 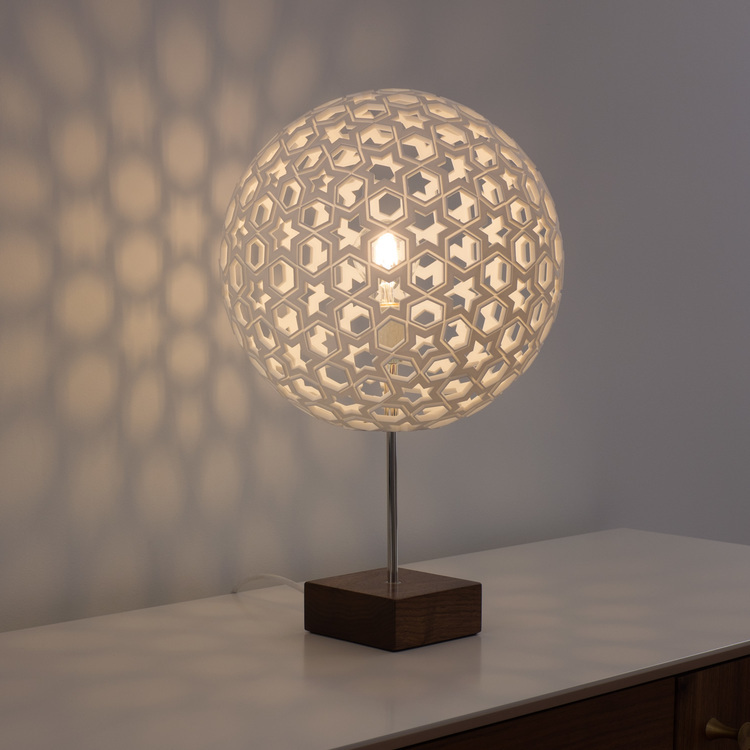 • UV-coated 3D printed laser-sintered nylon • Hand-finished walnut base • Polished nickel stem • Energy efficient LED bulb • Power usage: 15 Watts • Input voltage: 120/220 VAC The 'Sidon Table Lamp' was created by Robert Debbane Studio's, Brooklyn, NY. • Available in 2 sizes • 4 x 4 x 5 in. (Mini) • 9 x 9 x 10 in. 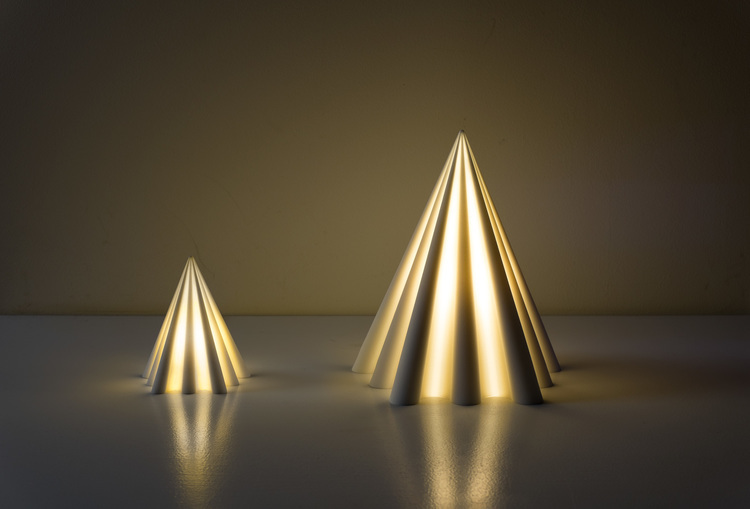 (Medium) • UV-coated laser-sintered nylon • Energy efficient LED bulb The 'Pyramid Table Lamp' was created by Robert Debbane Studios, Brooklyn, NY. 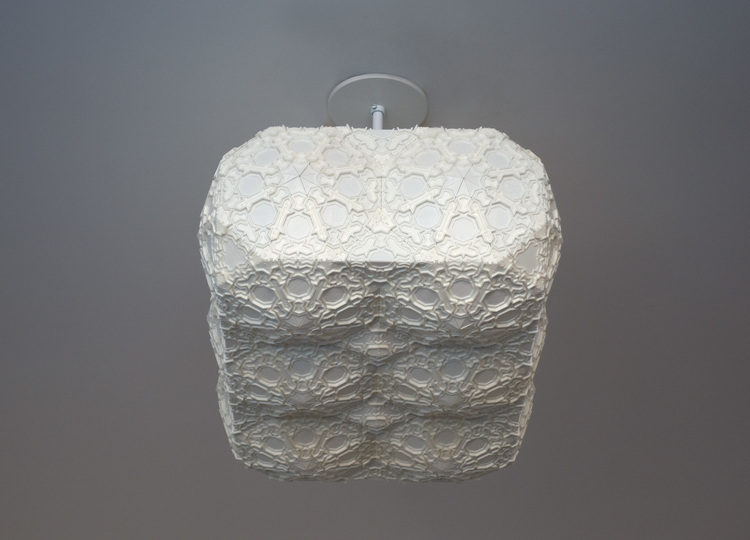 • UV-coated laser-sintered nylon • 12 x 12 x 12 in. 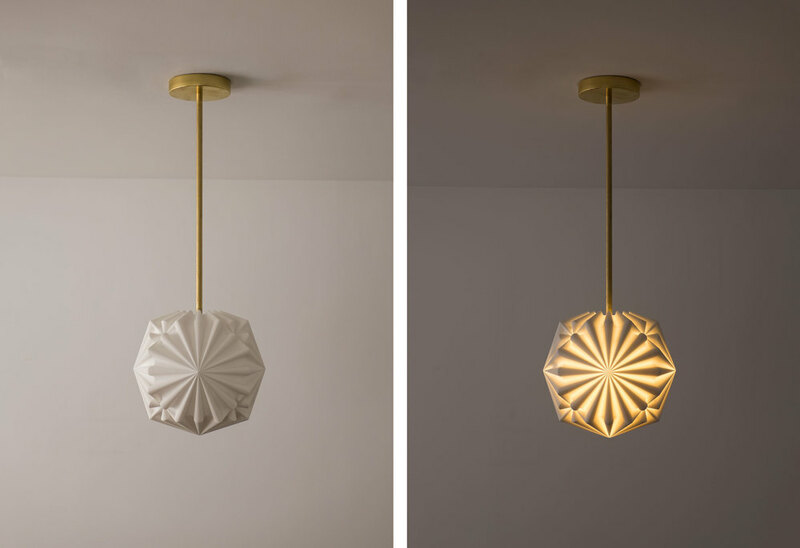 • Canopy and stem available in powder-coated steel, brass, antique brass, polished nickel (length of stem can be customized to adjust drop from ceiling) • Energy efficient LED bulb • Fully dimmable The 'Moonrise Pendant' was created by Robert Debbane Studios, Brooklyn, NY. • 24 x 17 x 11 in. 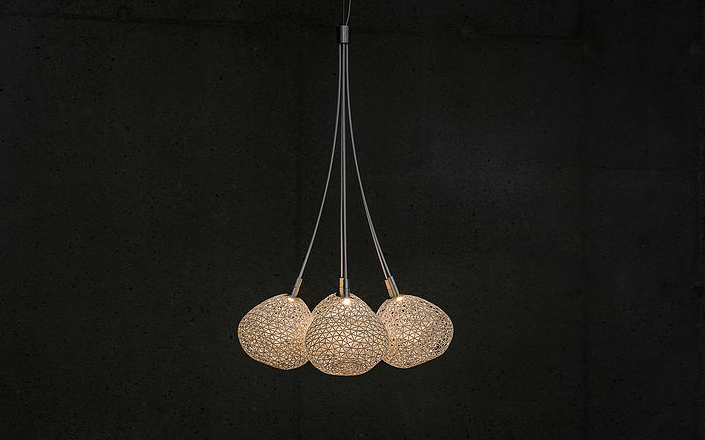 • UV-coated laser-sintered nylon • Canopy and stem available in powder- coated steel, brass, antique brass, polished nickel (length of stem can be customized to adjust drop from ceiling) • 2 Energy efficient LED bulbs • Fully dimmable The 'Moonrise Chandelier' was created by Robert Debanne Studios, Brooklyn, NY. 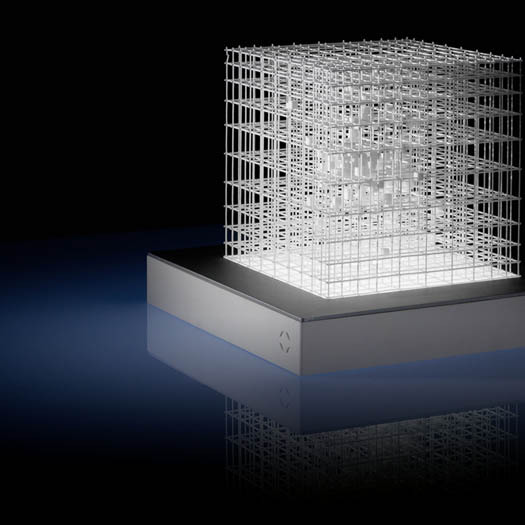 • UV-coated laser-sintered nylon • 6 x 6 x 6 in. 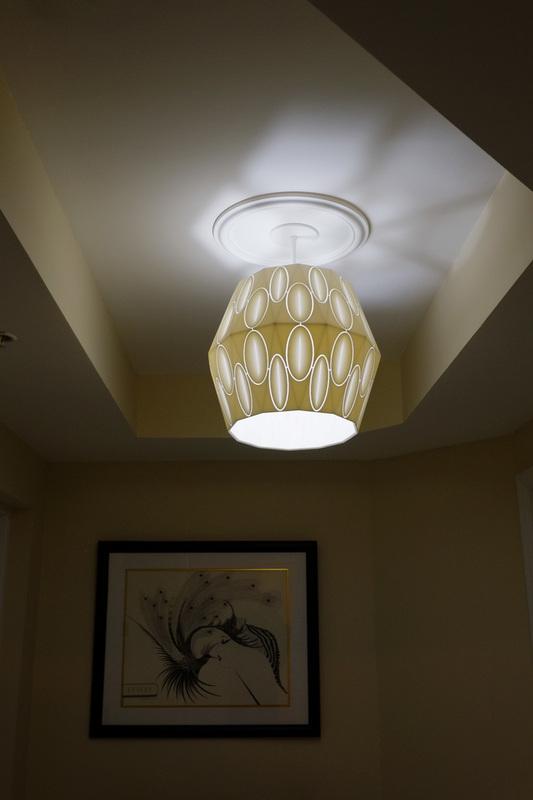 • 5” diameter canopy with 12V DC transformer • Energy efficient LED bulb The 'Minipod Pendant' was created by Robert Debbane Studios, Brooklyn, NY. • 12-in. 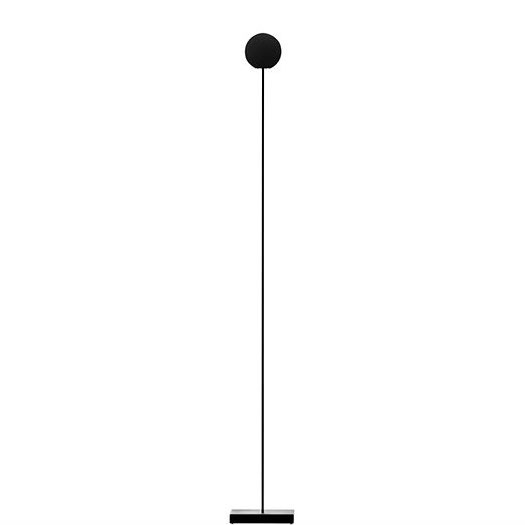 diameter, overall height 17-in. 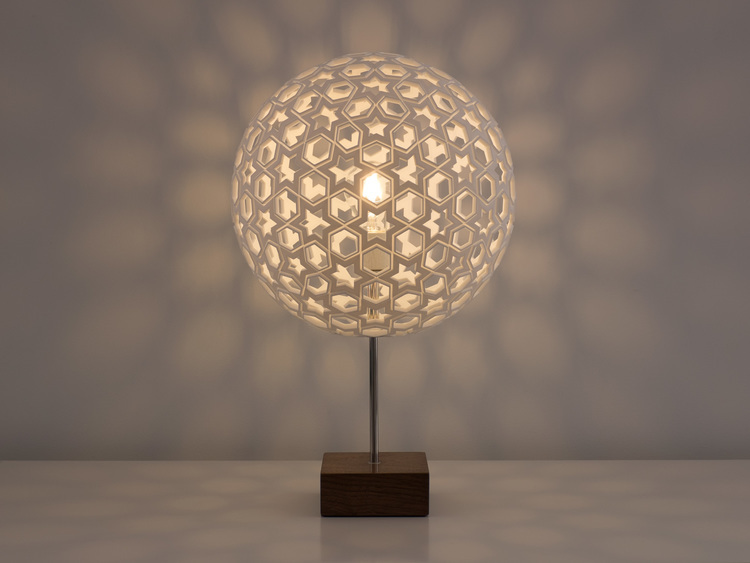 • UV-coated 3D printed ABS • Hand-finished walnut base • Polished nickel stem • Energy efficient LED bulb • Power usage: 15 Watts • Input voltage: 120/220 VAC The 'Galactica Table Lamp' was created by Robert Debbane Studios, Brooklyn, NY. • 3D printed ABS • 15.5-in. or 12-in. 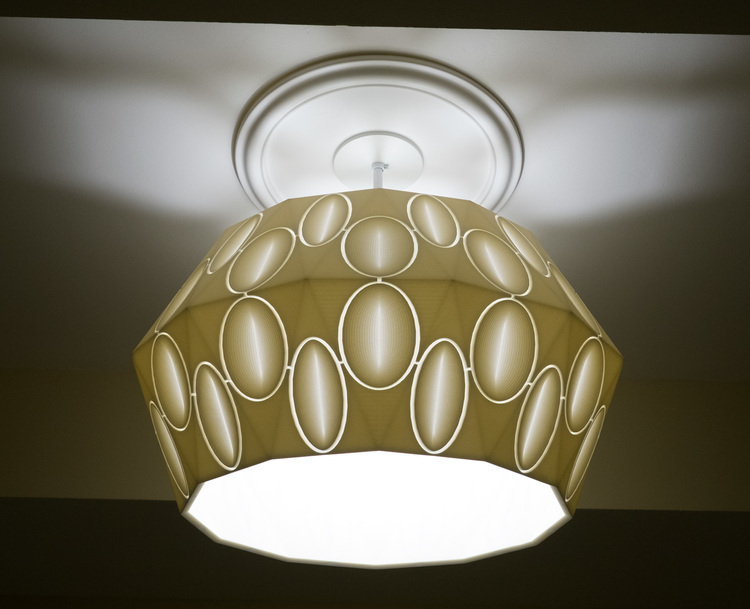 diameter The Galactica Pendant was created by Robert Debbane Studios, Brooklyn, NY. • 15.5-in. or 12-in. 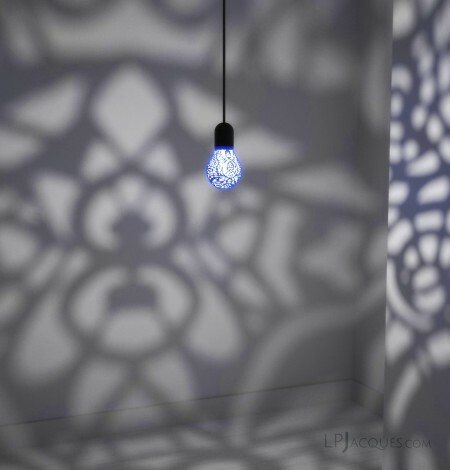 diameter • UV-coated 3D printed ABS • Canopy and stem available in powder- coated steel, brass, antique brass, polished nickel (length of stem can be customized to adjust drop from ceiling) • Energy efficient LED bulb • Fully dimmable The 'Fez Pendant' was created by Robert Debbane Studios, Brooklyn, NY. • 20-in. 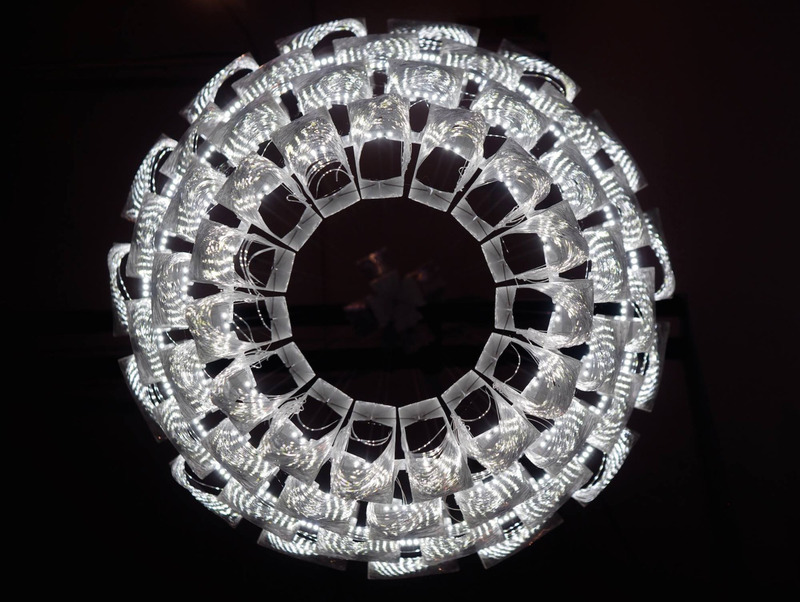 diameter • UV-coated 3D printed ABS • Energy efficient LED bulb The Sidon Chandelier was created by Robert Debane Studios, Brooklyn, NY. 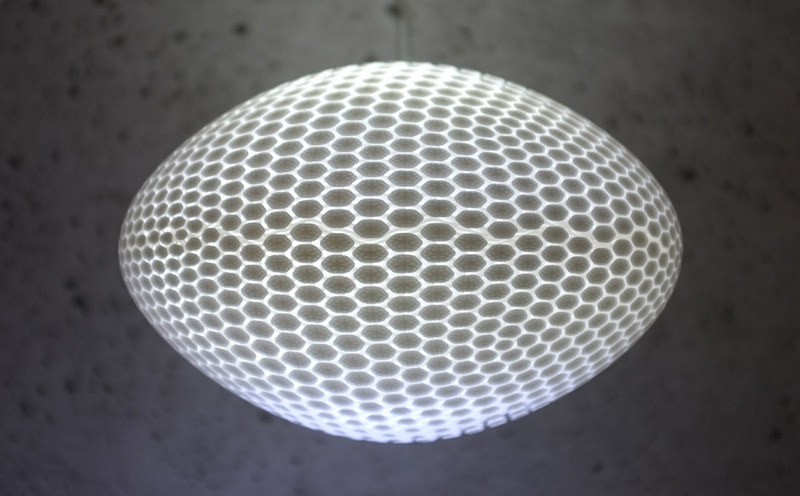 The 'Cocoon Lamp' idea derives from the parallelism between PolyJet manufacturing technology, a 3D printing technique for the production of particularly complex shapes, and the behavior of insects. 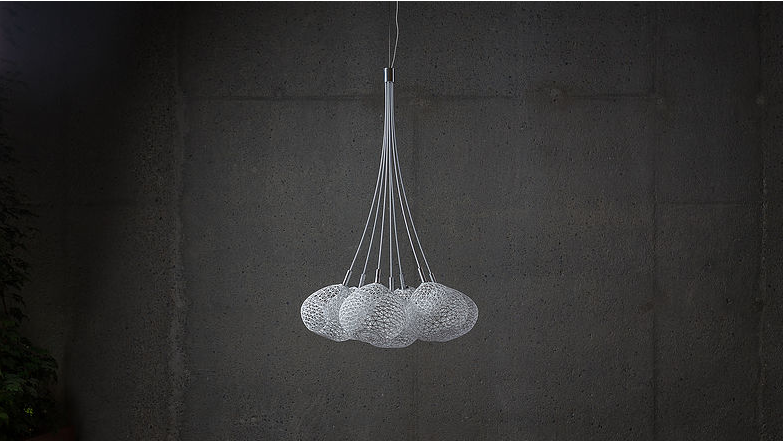 A piece of modern design on the edge between art, an outer structure with clean design, an organic form that highlights and, swinging, brings out the inner element. 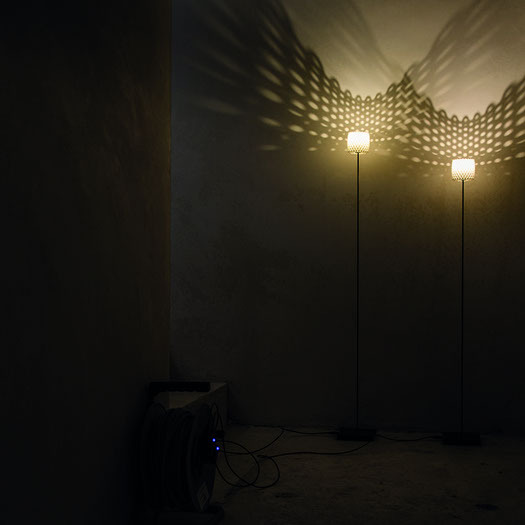 The project was inspired by the cocoon, the metamorphosis of insects, especially caterpillars. 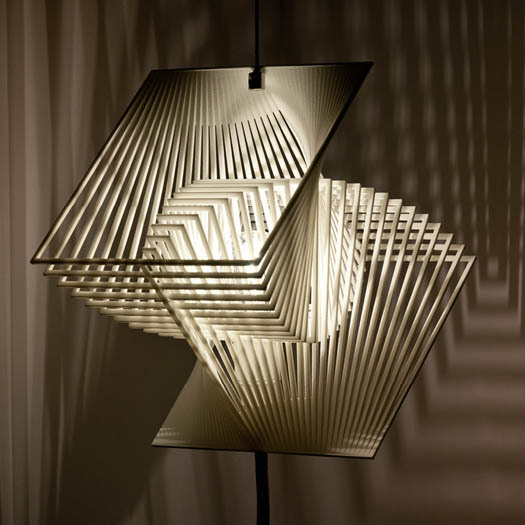 Geometry consisting of multiple elements that wind around the light source. 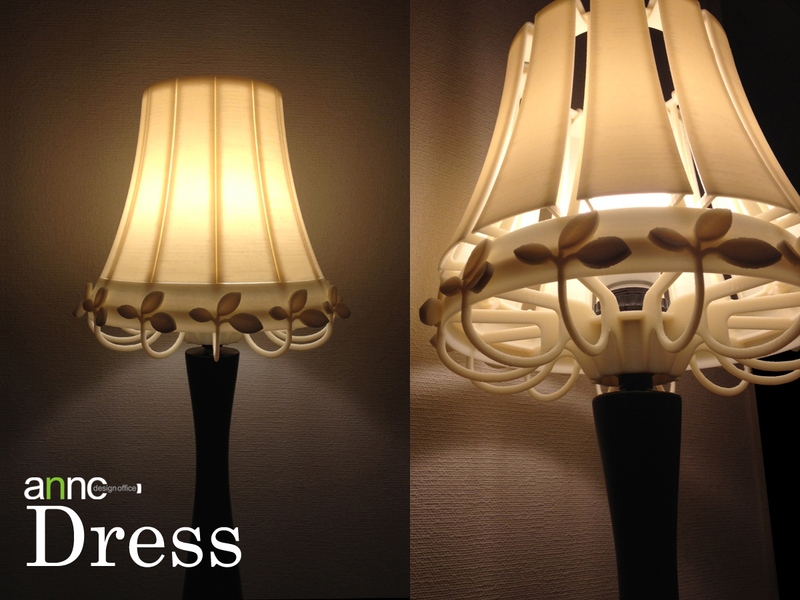 The lamp can be turned, laid or hung up in different positions. 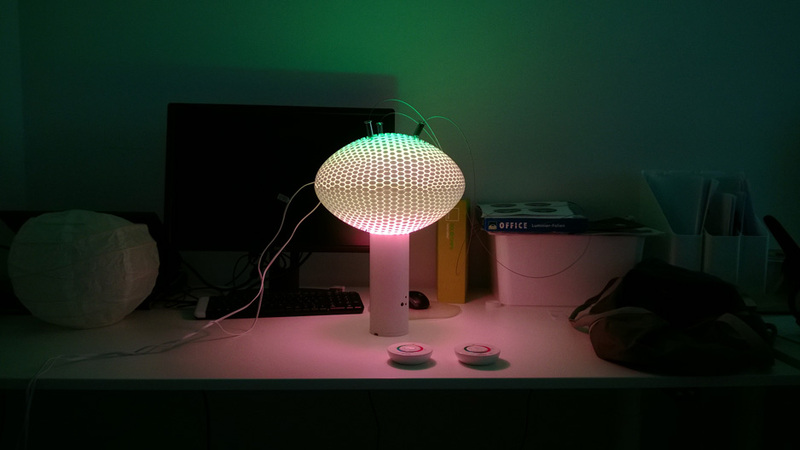 The optical appearance or the desired effect can be defined by the user. 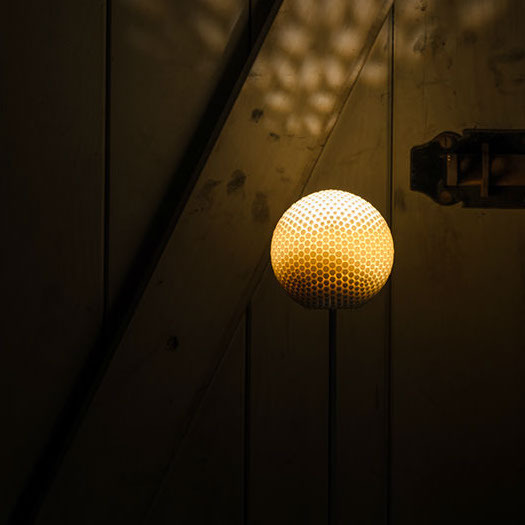 Cocoon Lamp was designed back in 2011 by Patrick Günther, a designer dedicated to light and design and André Osthaar, both members of the 'Voxel Studio' design collective. 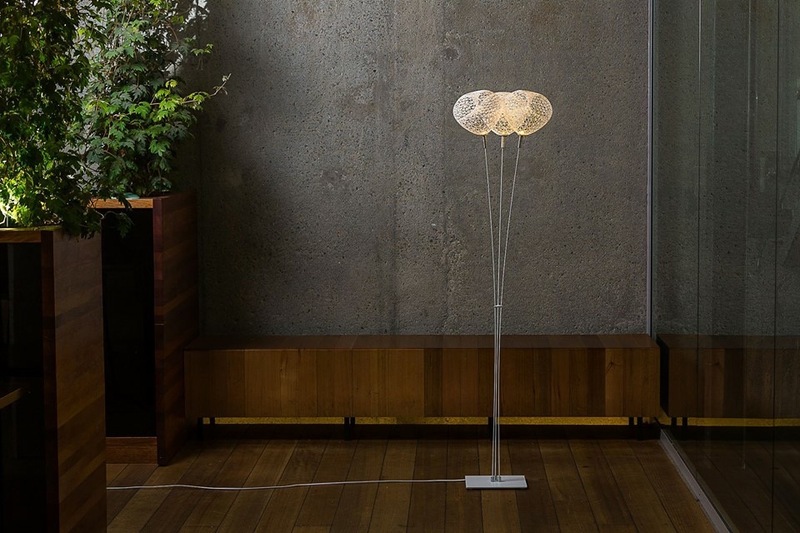 Anno Design proposes a next-generation lighting design. 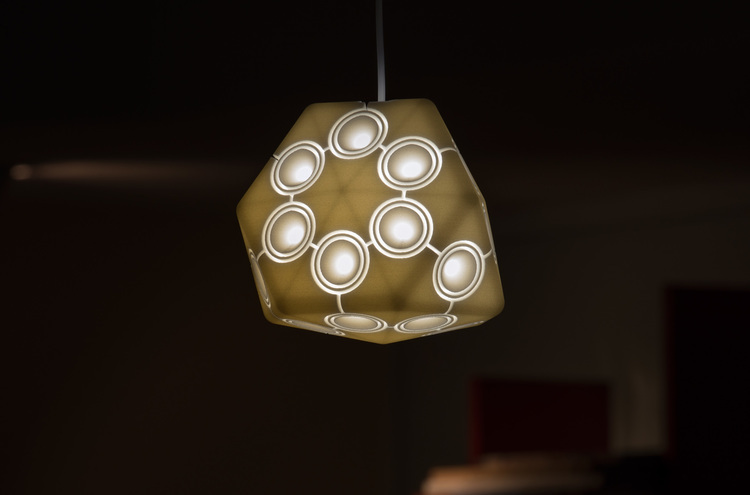 AD have been trying to design lighting by using 3D printer and OLED. It will show you completely new ideas. 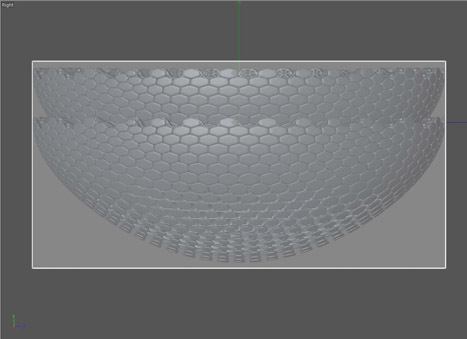 Here are some first glances of their work! 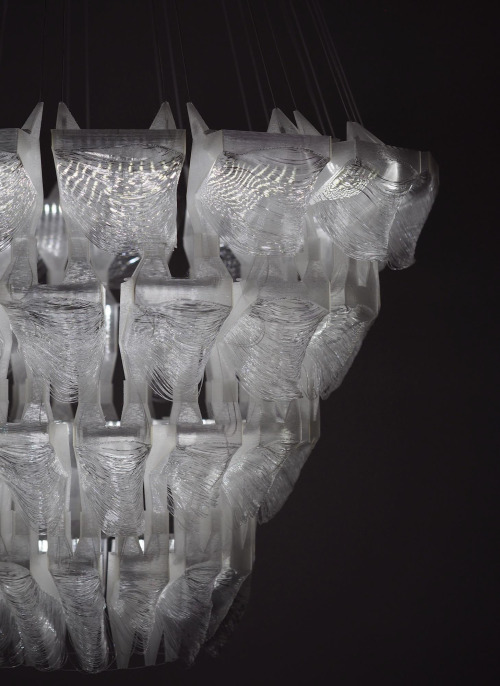 The Luster Chandelier is the result of an experiment with desktop 3d printer. 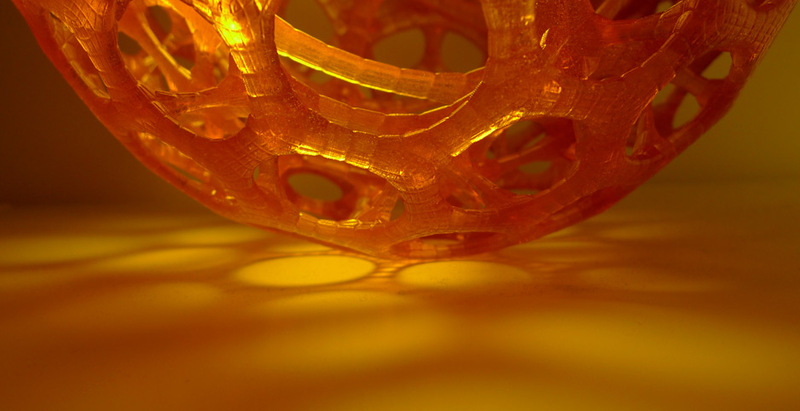 Instead of following all recommended settings, support material is omitted in places where it is needed to reach new form. 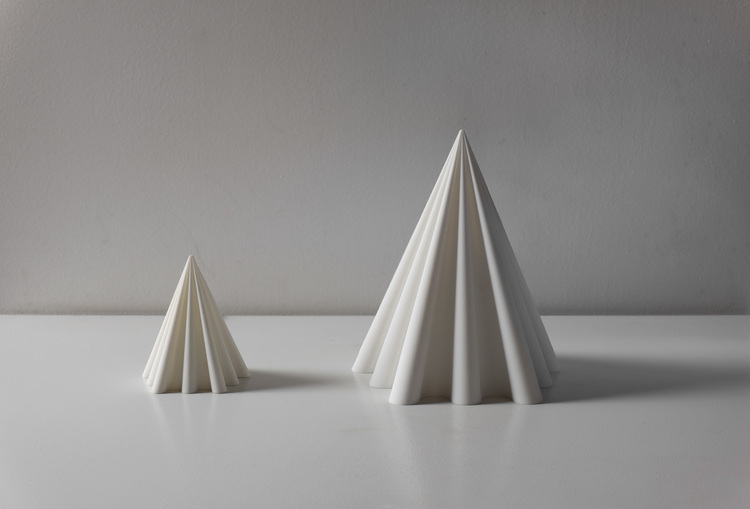 The final piece doesn’t correspond with the digital model, but arise from a flaw – fallen layers of plastic. 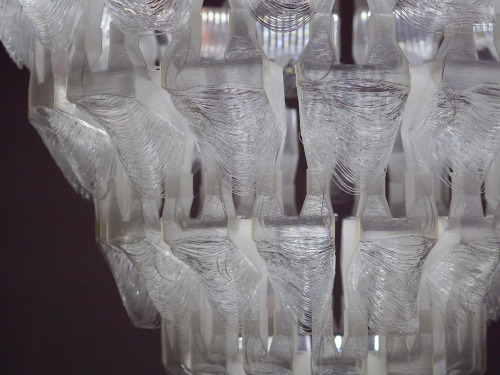 This mistake becomes an advantage, the main and decorative motif of the object that refers to traditional chandeliers. 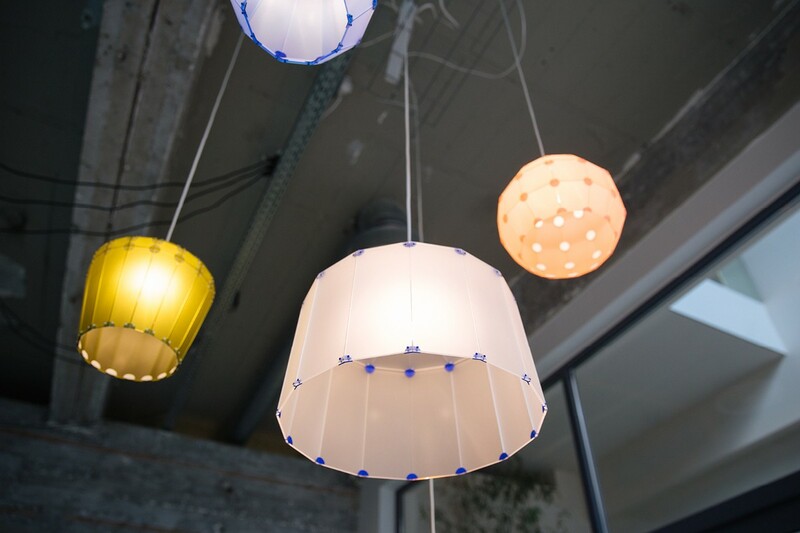 Luster is assembled from 60 pieces of separately printed parts and made-to-measure LED lighting. 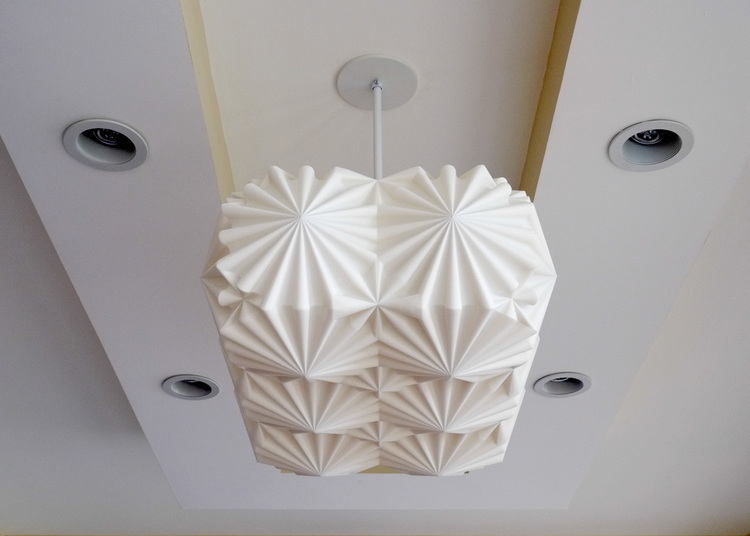 This 3D printed chandelier was created by Sylvia Lovasova. 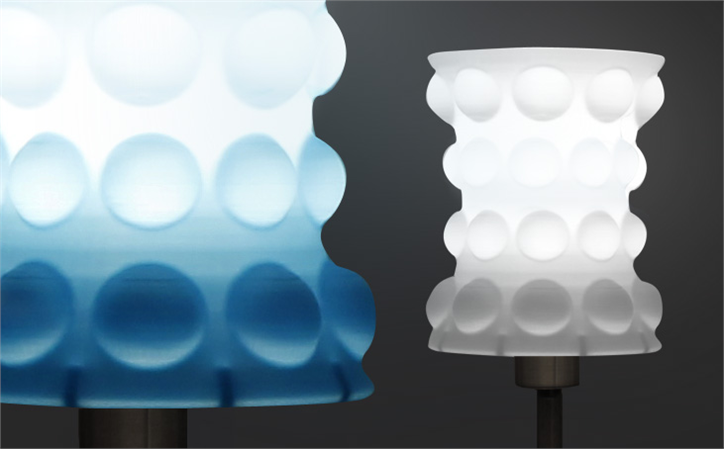 he lamps conceived by Danish designers Strand + Hvass are influenced by the play of light. Specifically the shadows created by sunshine breaking through the trees. 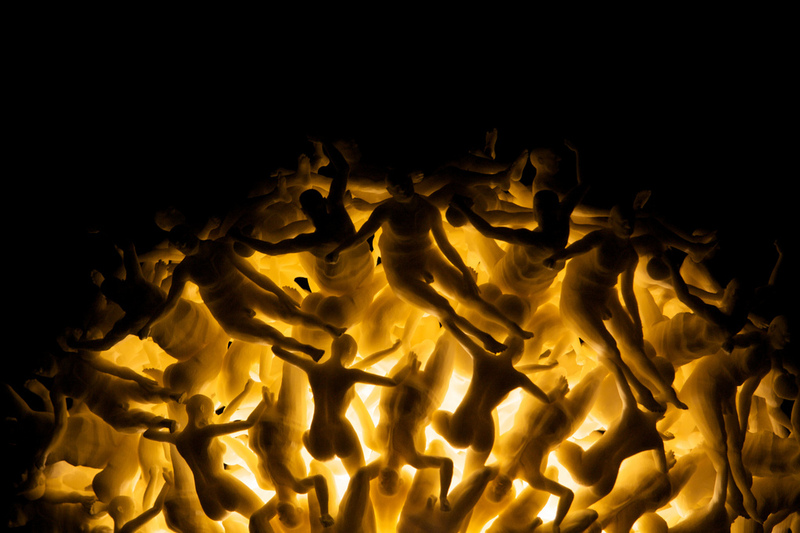 More than 3,000 sticks have been intertwined on the lamps themselves to recreate this captivating scene. 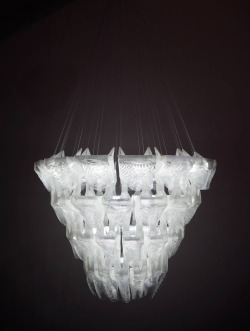 Designed by Dutch architect Luc Merx, the Damned.MGX chandelier was produced using additive layered fabrication as one piece, without joints or seams, and would be impossible to produce using other manufacturing methods. It appears as a hovering mass of writhing nudes – opulent and bombastic – and recalls the classical motif of the fall of the damned, challenging viewers with age-old questions of guilt and morality. 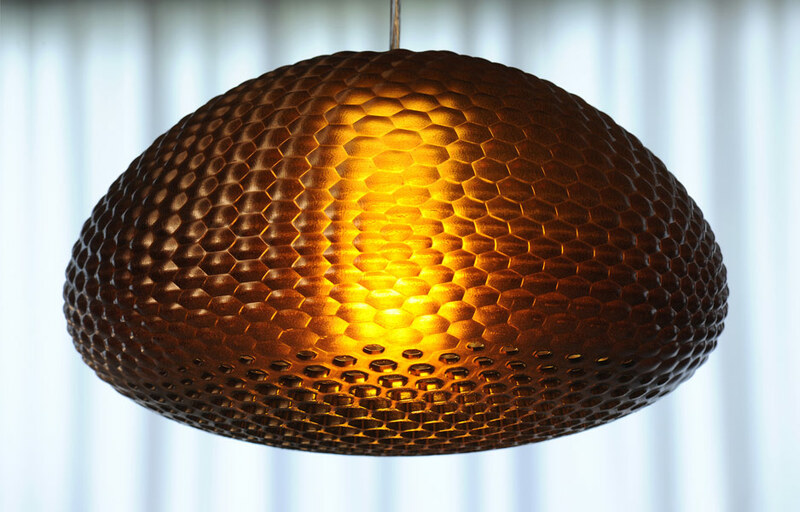 The Dragonfly.MGX pendant light draws inspiration from the curved honeycomb structure of insect eyes and their optical qualities. 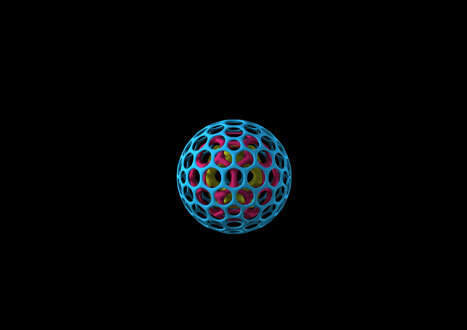 The fascination for us lies within its complex three dimensional array of photoreceptor cells or in this case light emitting cells. 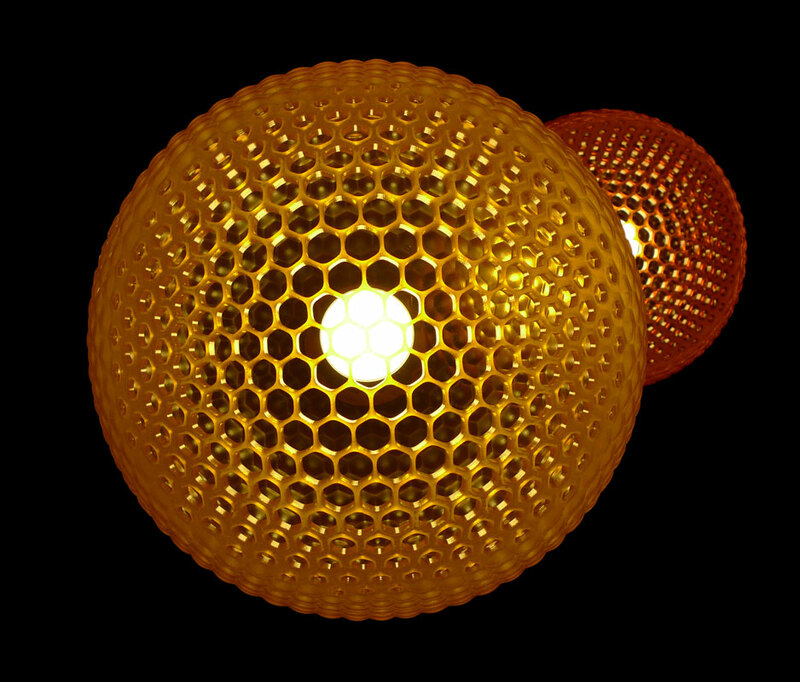 Dragonfly.MGX is taking functional requirements like glare shielding and direct/indirect light into consideration. Therefore the skin is closed on the upper cells and gradually opens up towards the lower part to let more light pass through. 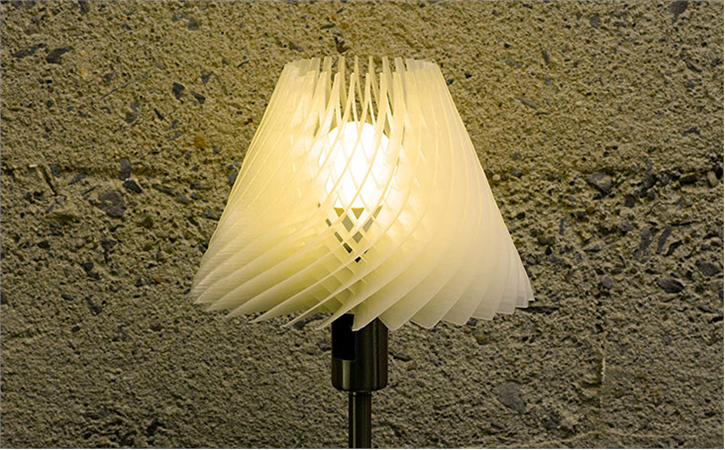 It utilizes a standard size light bulb e.g. 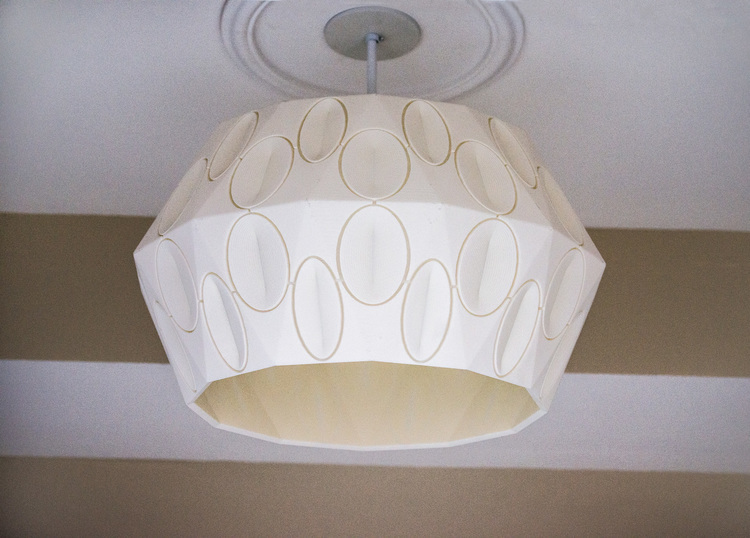 an energy saving ligh bulb E27, thus making it a fully functional pendant light. 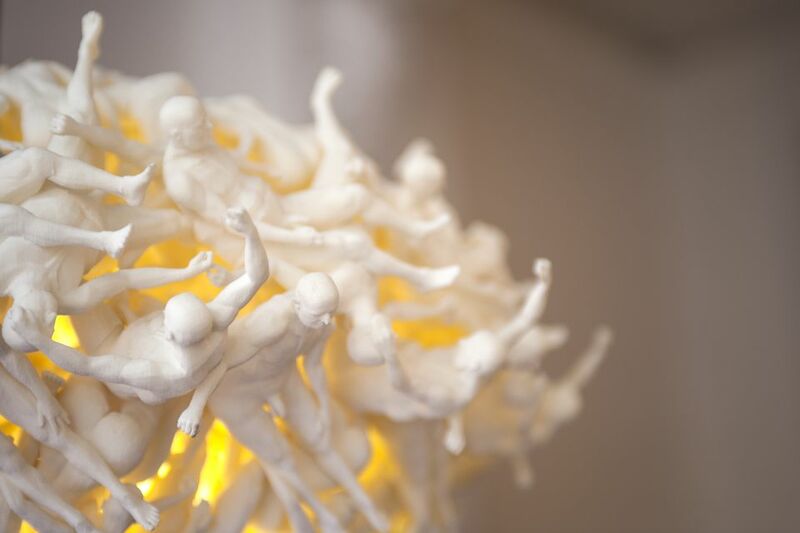 Dragonfly.MGX is made in Epoxy and is produced with 3D printing technology. 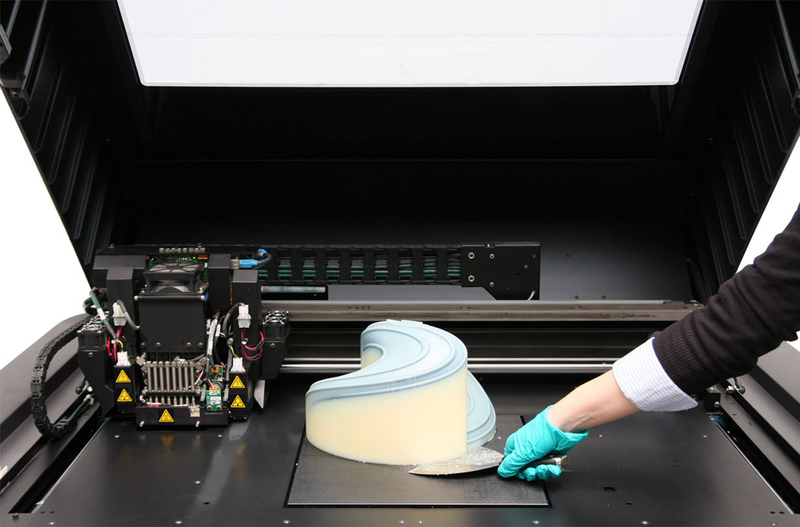 This process becomes more and more interesting for mass production. 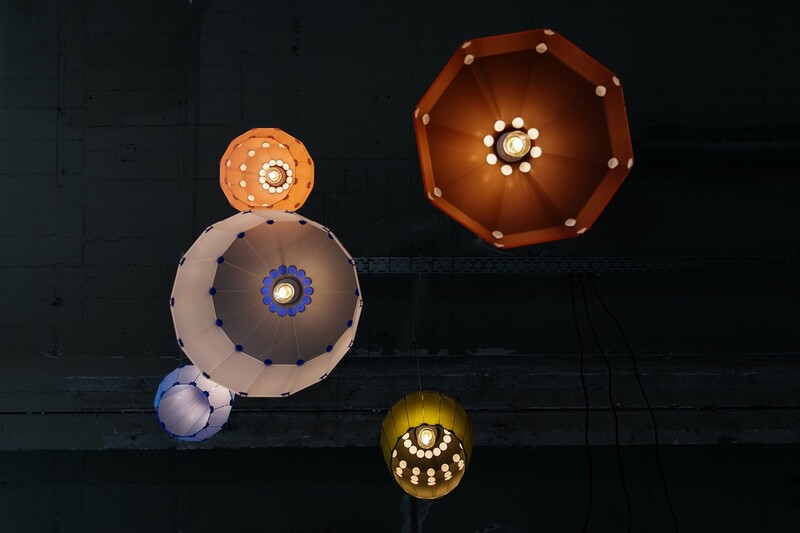 Since the Light + Building in Frankfurt in April 2012 the Dragonfly.MGX light has a younger and smaller offspring that is available as a triplet chandelier. 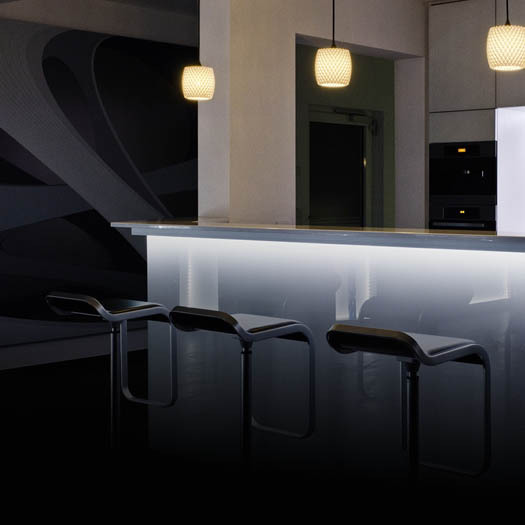 On 13th April 2010 Dragonfly.MGX was introduced to the public at the furniture fair in Milan/Italy in Via Tortona 19 and at Light & Building in Frankfurt/Germany. 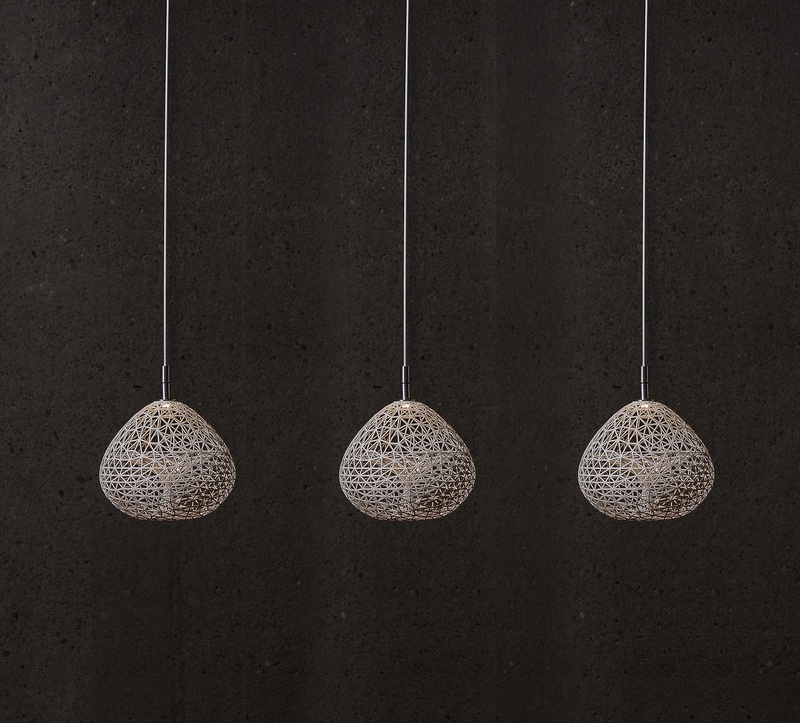 Diatom.MGX reflects our interest in the parallels between forms that can be found in nature and mathematical geometries. 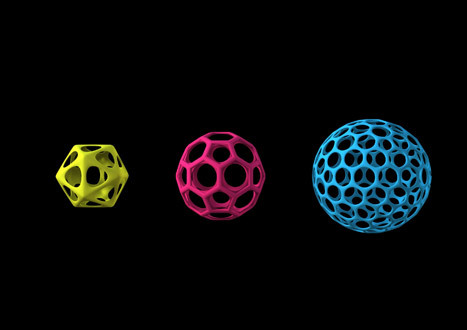 By interlocking and connecting basic geometrical bodies like the icosaeder and bucky ball, an almost organic and natural object is created, further intensified by a surface structure that originates from the tessellation given by the CAD software. 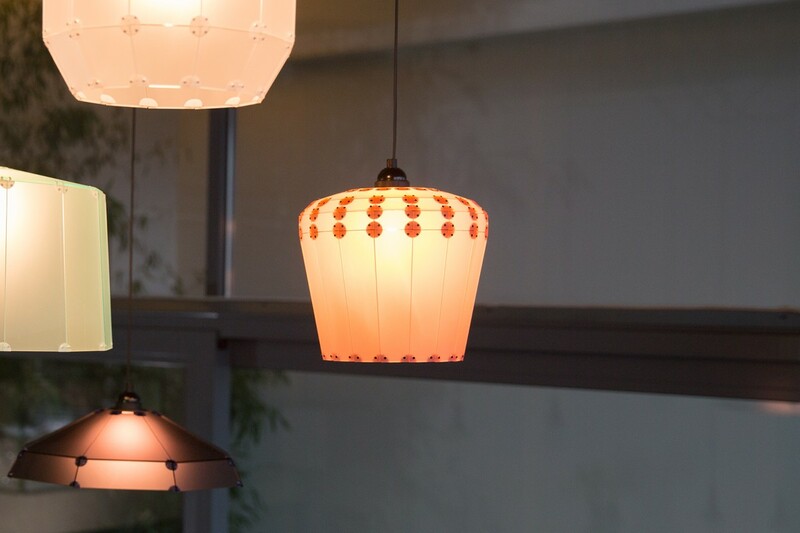 It uses an energy saving E27 bulb, making it a fully functional room light. 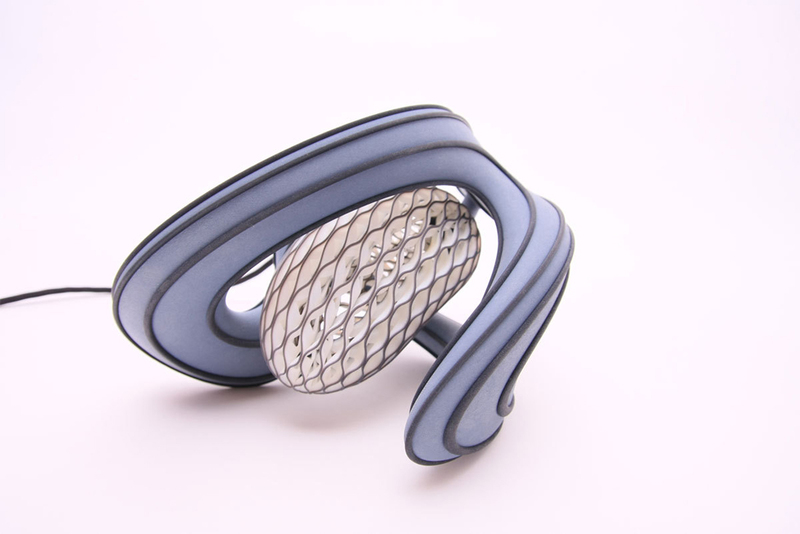 Diatom.MGX is made in Epoxy and is produced with 3D printing technology. 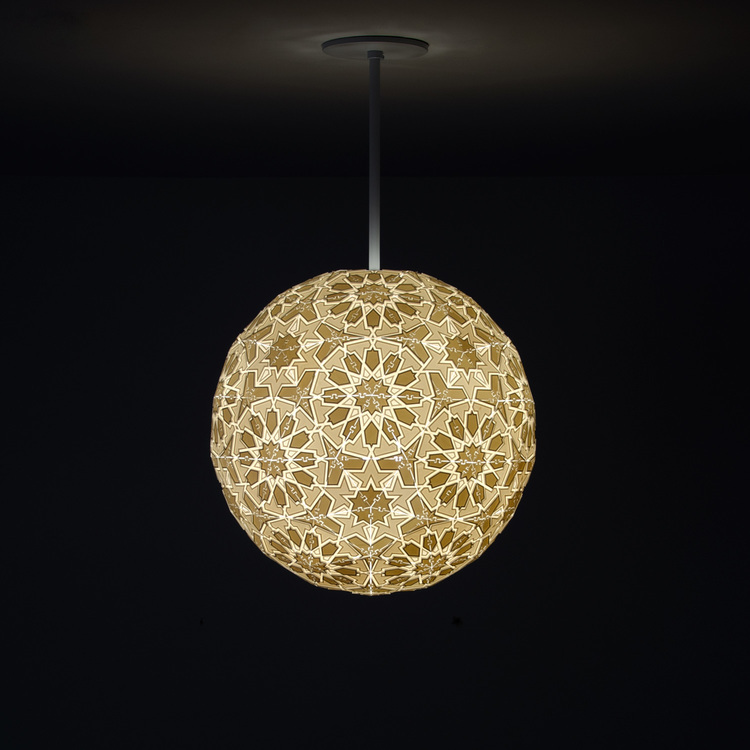 It is available in two colours - Terra Cotta and Amber. 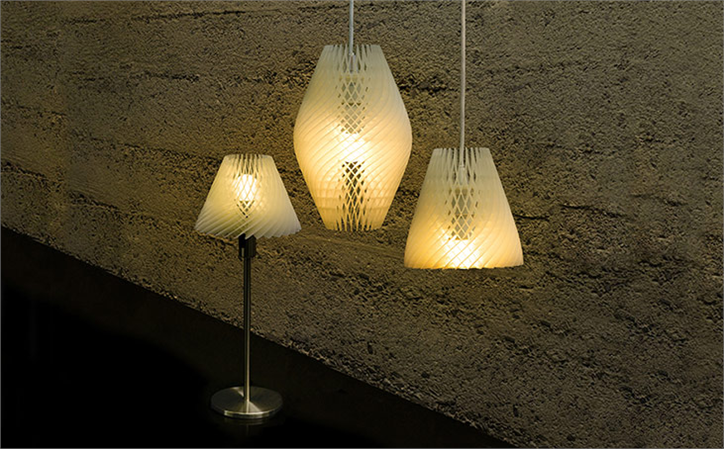 On 12th April 2011 Diatom.MGX was introduced to the public at the Euroluce during the Salone del Mobile in Milan/Italy . 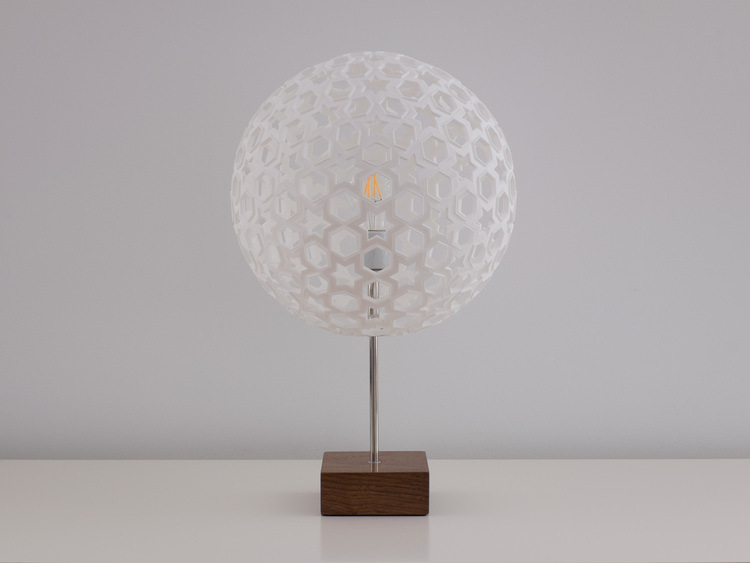 The agile and bionical inspired table lamp ‘Natrix’ is an excellent tool to create a perfect light scenario for any situation. 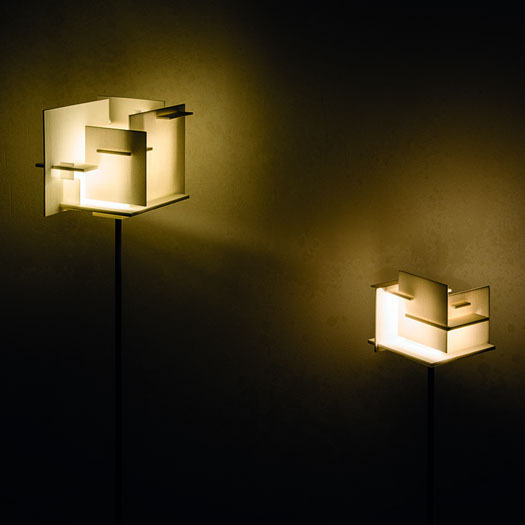 The flexible arm can be formed into any direction to optimally guide the light to demand. 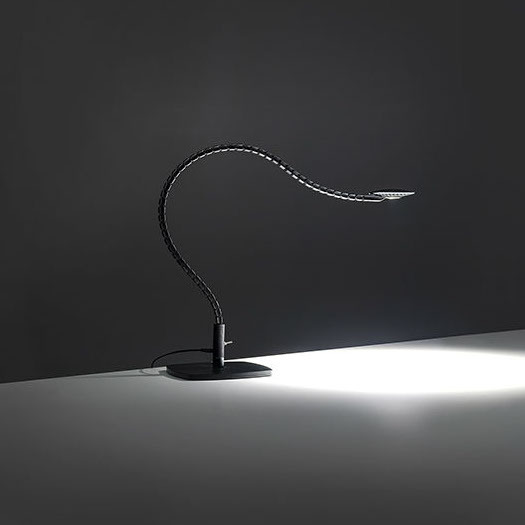 Natrix is available as table or reading light on demand. 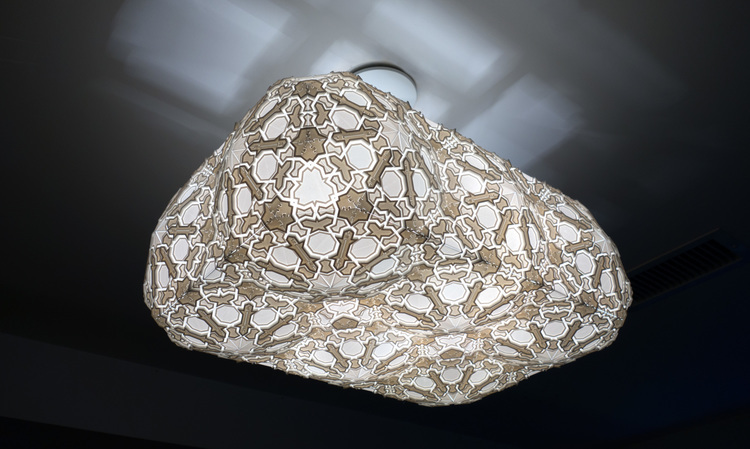 Design by Hans Nopper and Thomas Lück. The project was realized in close cooperation with iulite. 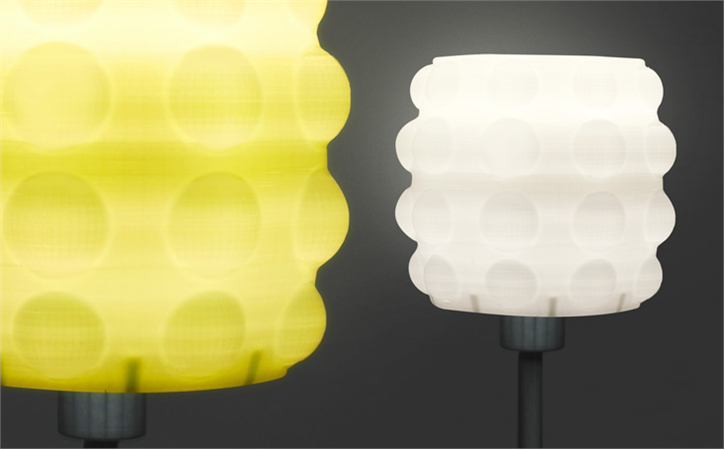 The stand light ‘Petala’ is a briljant example of creating esthetical attractive with additive manufacturing. 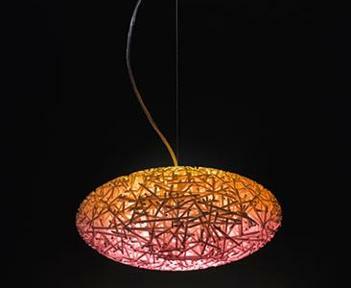 This perfect synergy of design and intelligent mechanics creates an association with flourishing leaves. 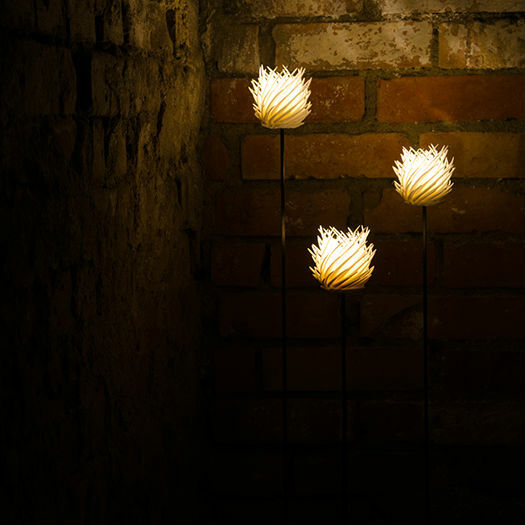 The integrated screw mechanism enables to shrink or expand the leaves into a custom light experience. 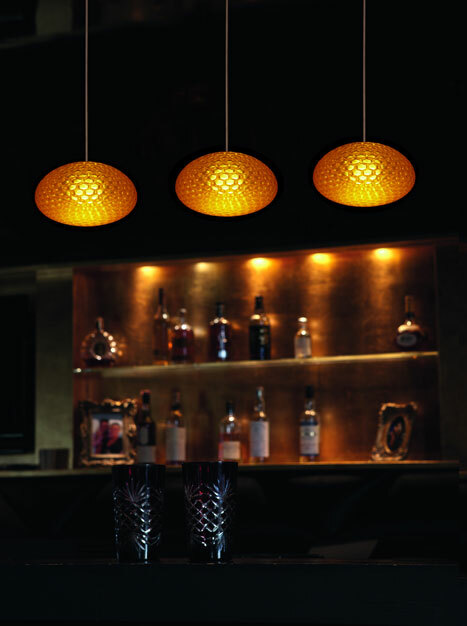 The LED fixture is compatible with all lamp shades from the sls-series. The design was honored with a Special Mention’ during the 2015 German Design Award. 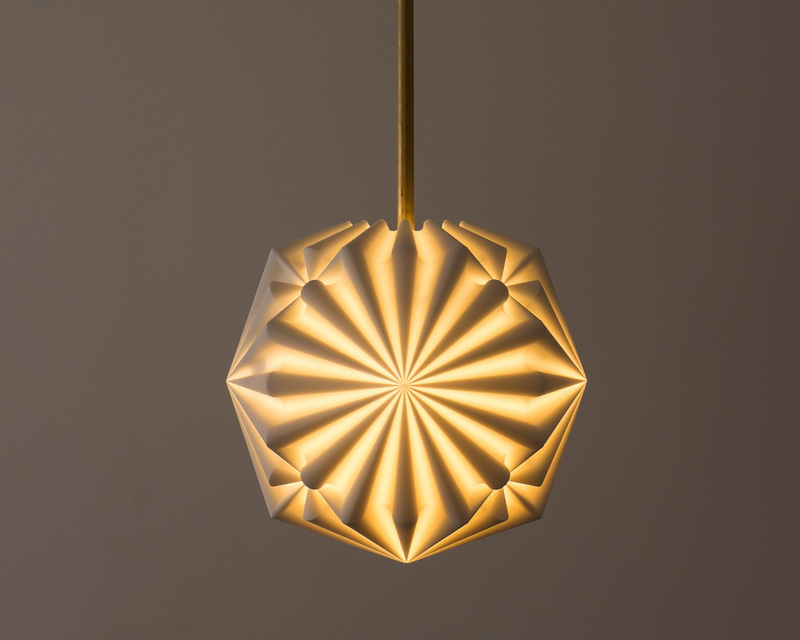 Design by Sven Eberwein. 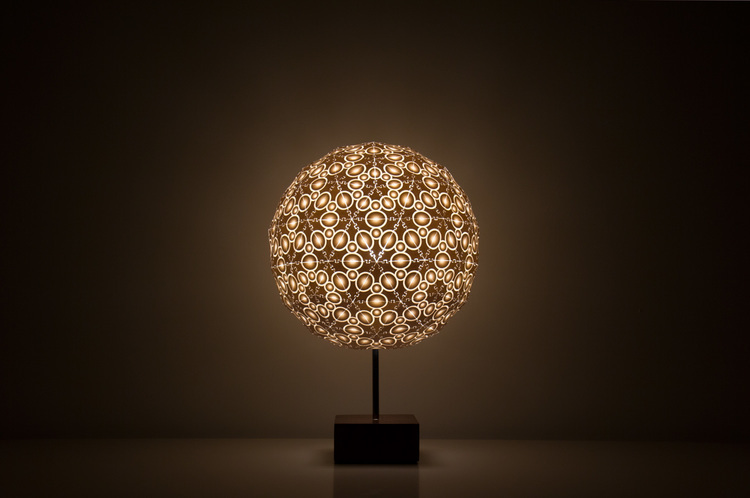 ‘Photon sls’ combines minimalistic form language with filigree details. 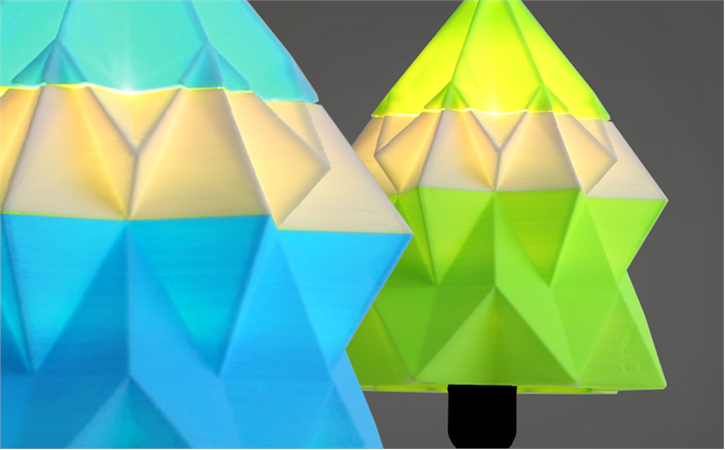 Formed by hundreds of small cones, the shade creates zones with various gradients in light transmission. 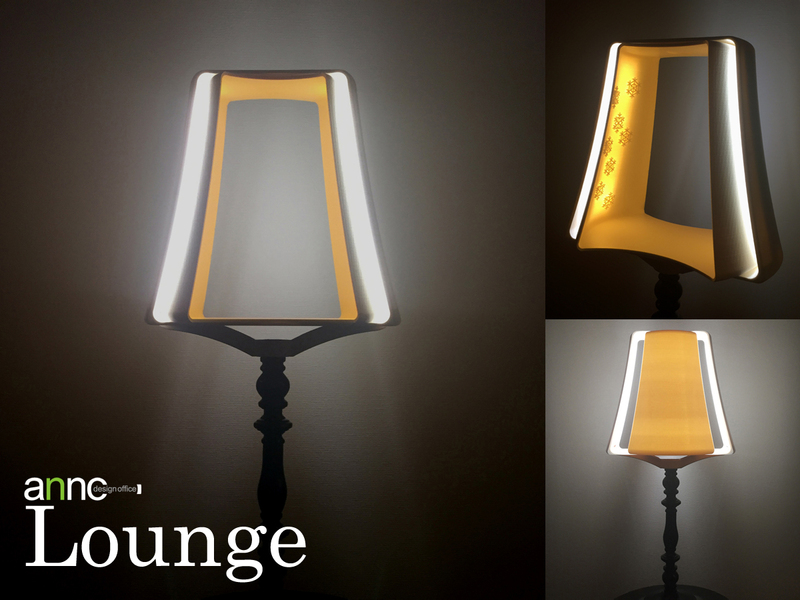 The light offers herewith a welcome anti-glare protection and delivers a great light-shadow experience. 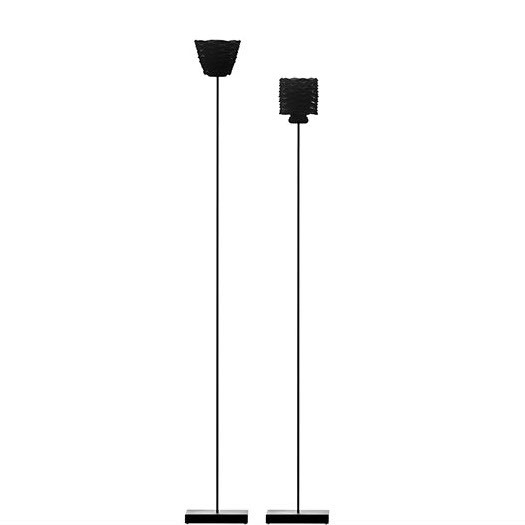 The LED fixture is compatible with all lamp shades from the sls-series. 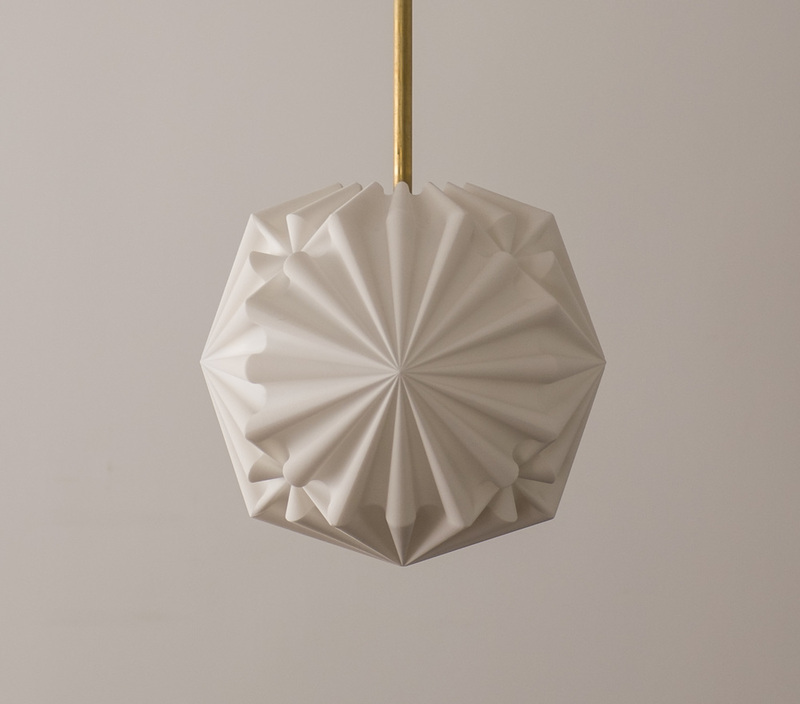 Design by Frank Kleemann. 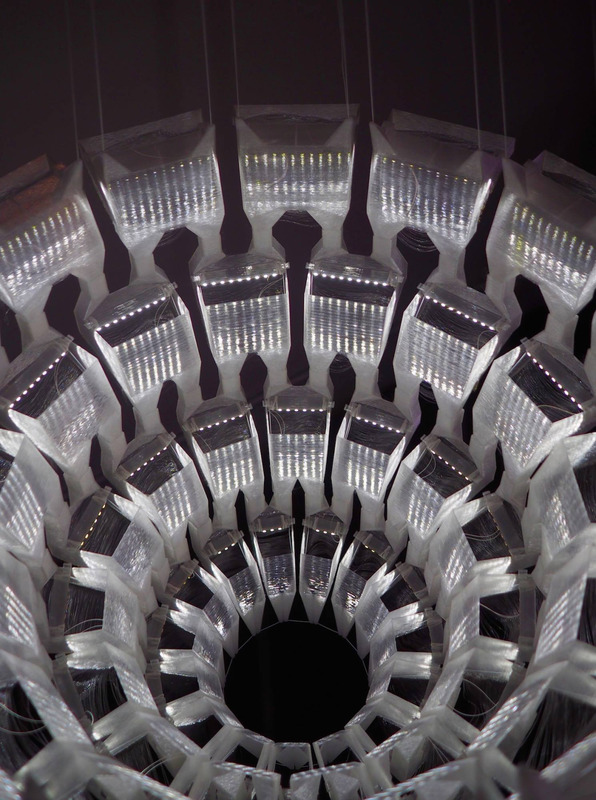 Despite its digital invention ‘Spike SLS’ functions as a natural organism. 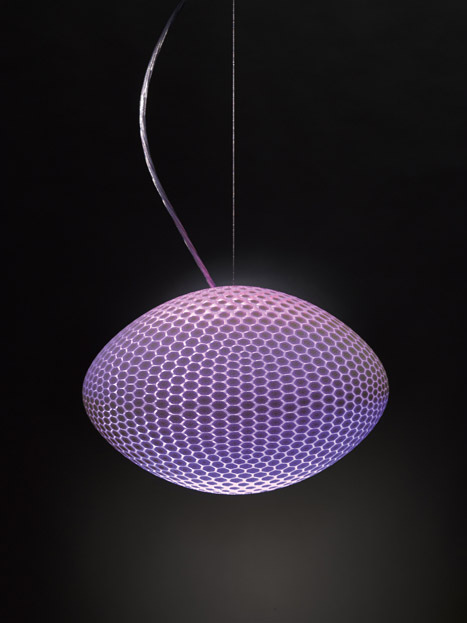 The fine light rays are emitted radially and create the impression of a living, moving body. 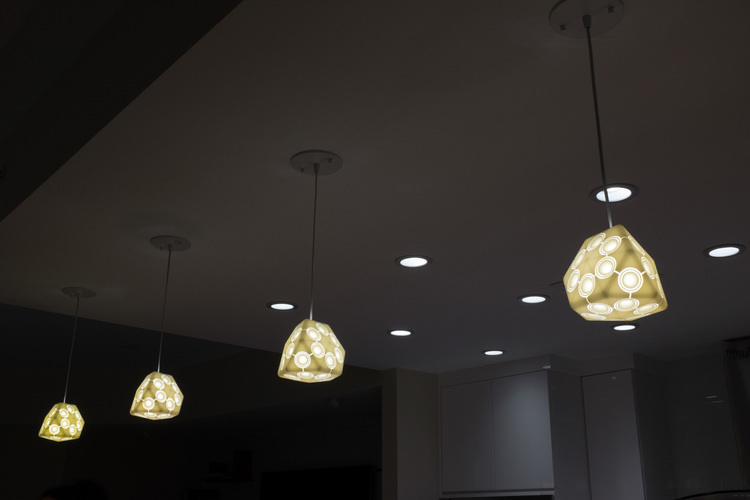 The LED based fixture is compatible with all lamp shades of the sls-series. 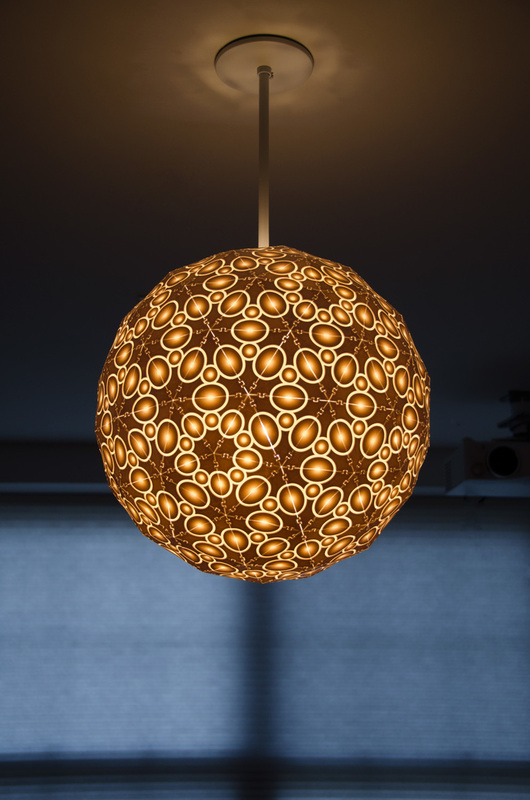 Design by Frank Kleemann. A luminaire describing a town by its own shape. The size of the city‘s area, living area, population, museums or pubs represented by horizontal and vertical surfaces. 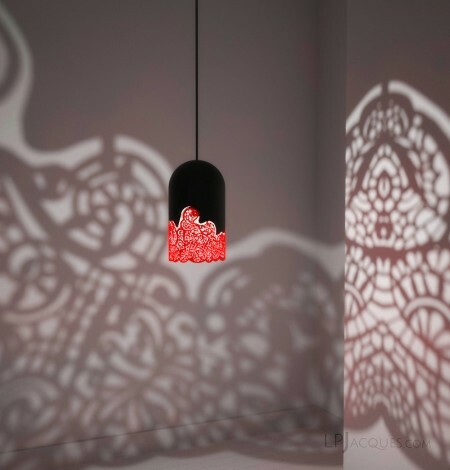 Rooms and shadows are created evoking memories of urban beauty. 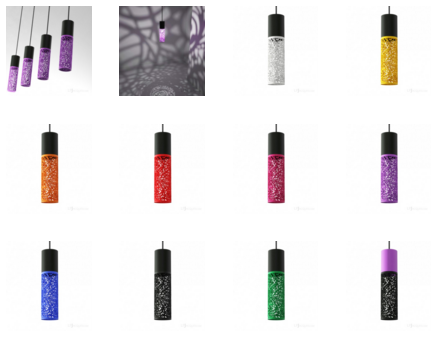 LED luminaire compatible with all other lampshades of the sls series. Berlin/New York/London/Hongkong. 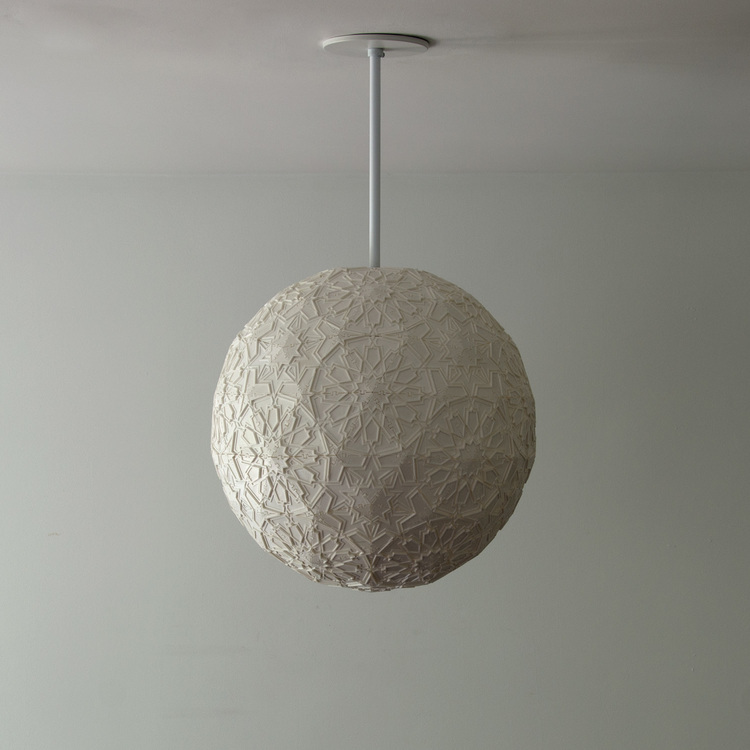 Design by Studio Mark Braun. 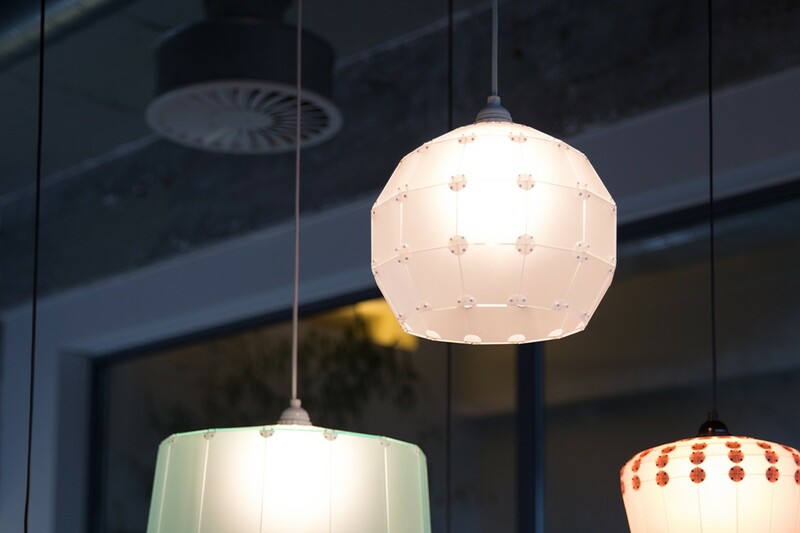 The spatial structure of the pendant luminaire ‘PORE PL’ consists of several layers of interconnected tubes shifted towards each other. 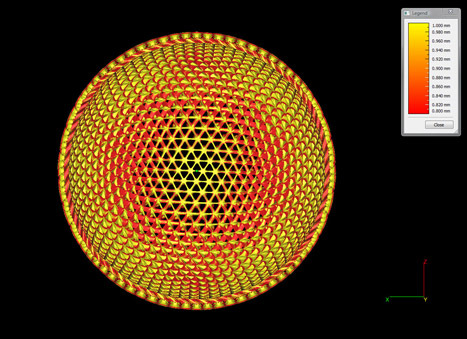 The flowing transitions and the changes of direction from convex to concave are reminiscent of mathematic minimal surfaces. 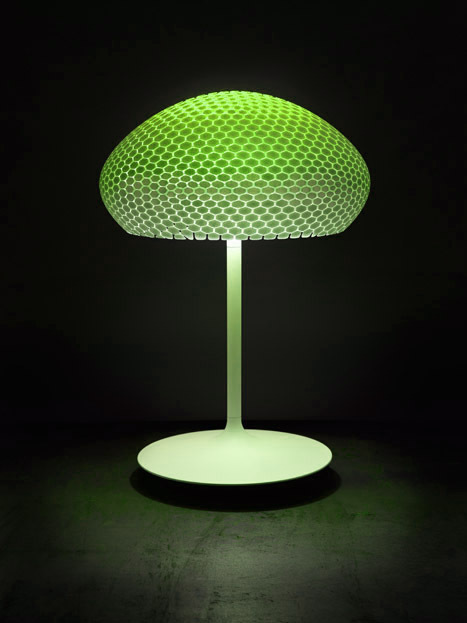 The impression of its structure however stays organic and one could associate it with flora or microorganisms. 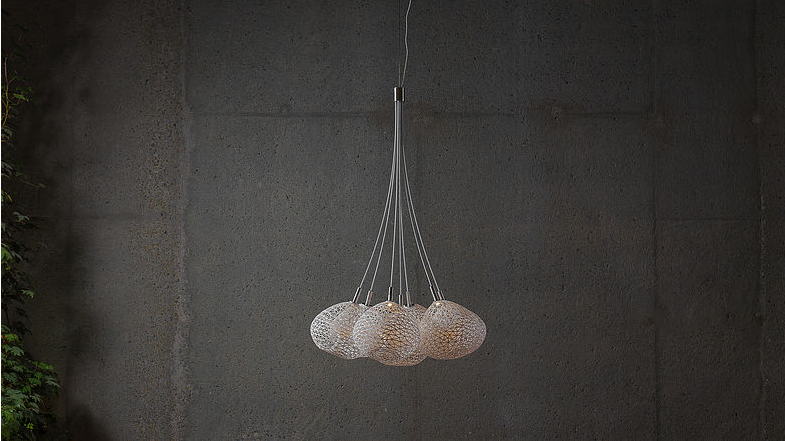 The complexity of this exclusive pendant light contrasts aesthetically with the simplicity of the basic shape it describes. 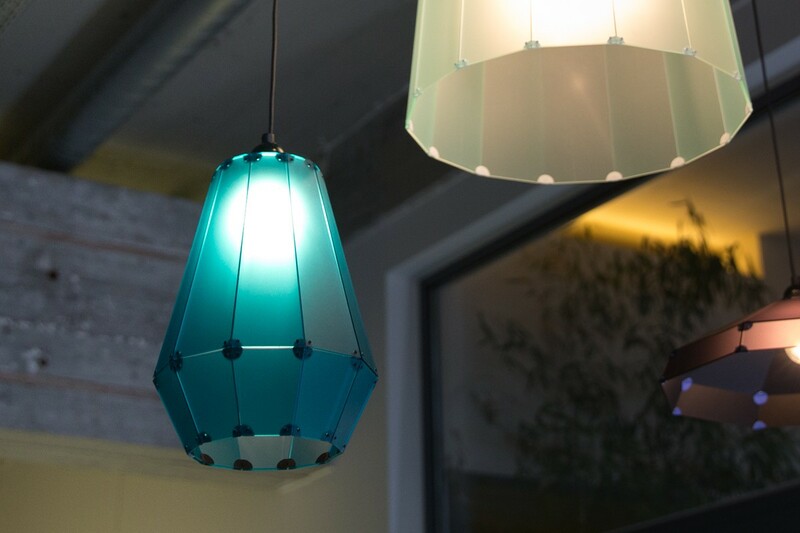 Due to the particular structure of the lampshade PORE PL offers you exciting ways to illuminate your surroundings but stays almost glare-free at the same time. 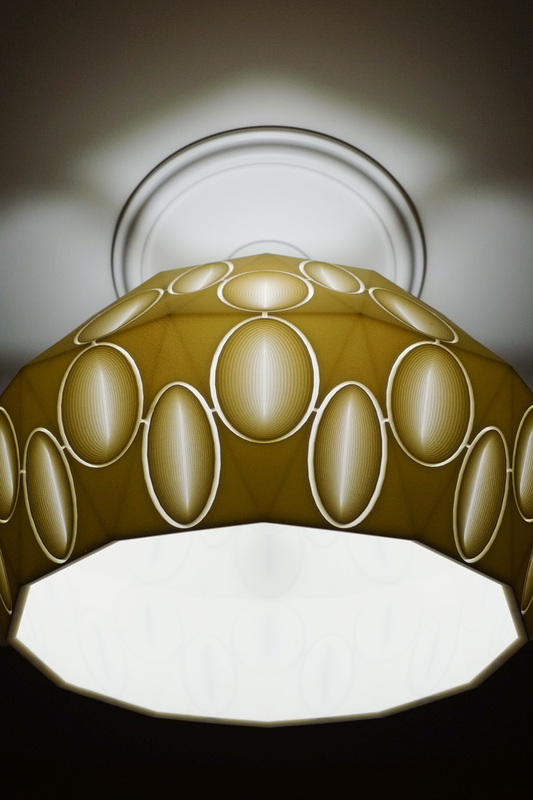 Design by Frank Kleemann. 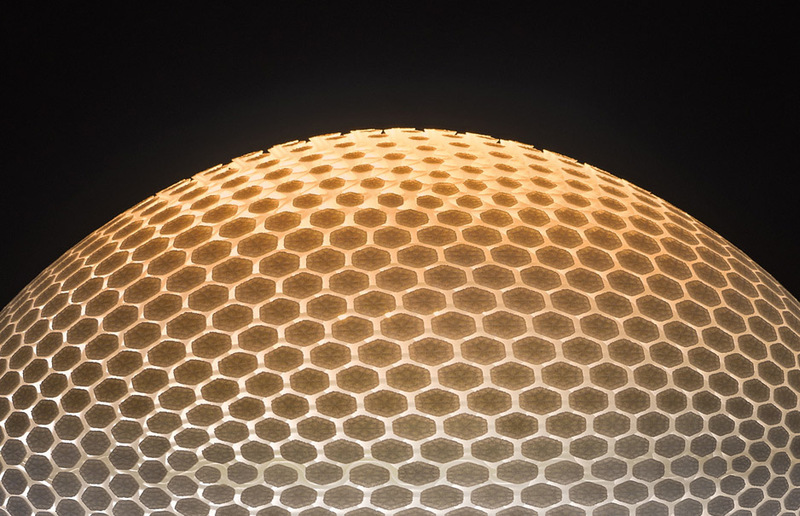 As an contemporary innovative lighting object, the geometric design of ‘SWARM’ connects nature with culture by referring to the swarm theory. 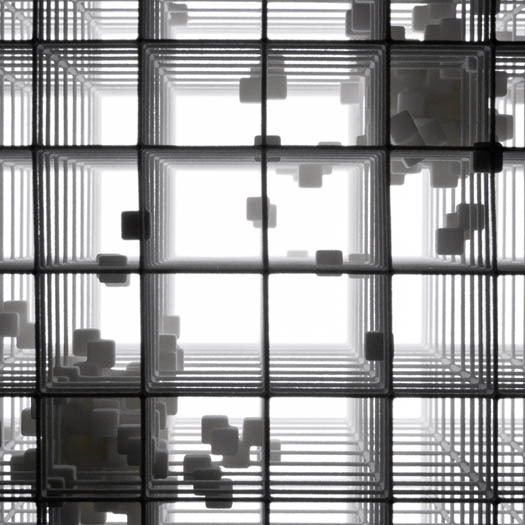 The principle of flocking behavior herein is reflected as a correspondence to the composition. If the swarm is being attacked, it increases so that the attacking bird ceases. 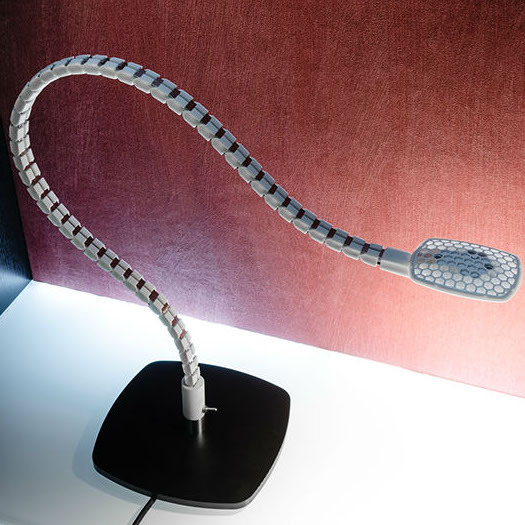 The application of LED-technology tops off the lamp concept. 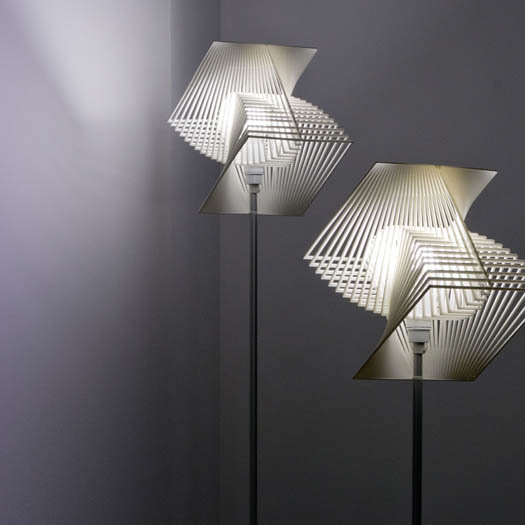 Design by Sabine Peter. 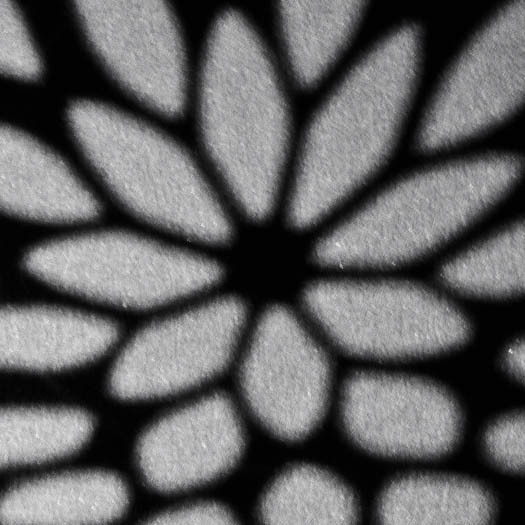 Aesthetic, movement, shadow play and intelligence. 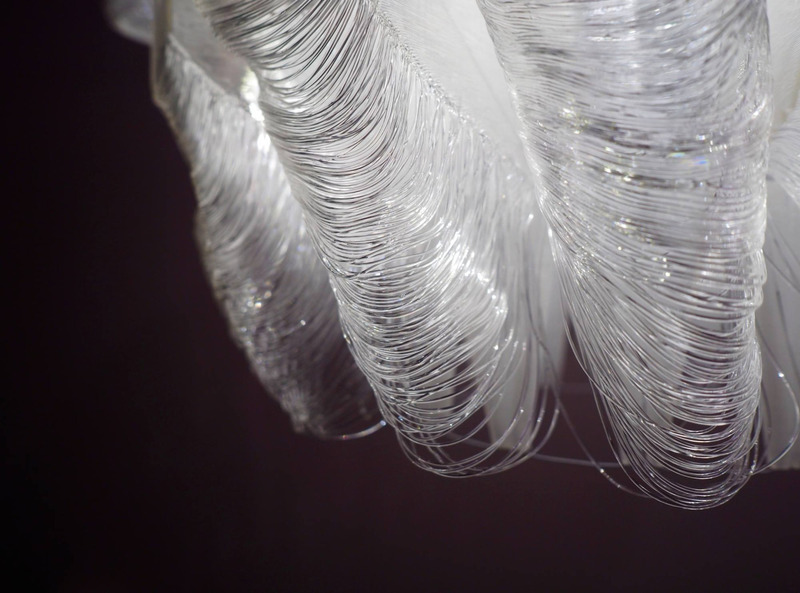 All of those qualities come together in the chandelier, called ‘CASCADE’, which can be produced on the very small construction space of about 70mm. 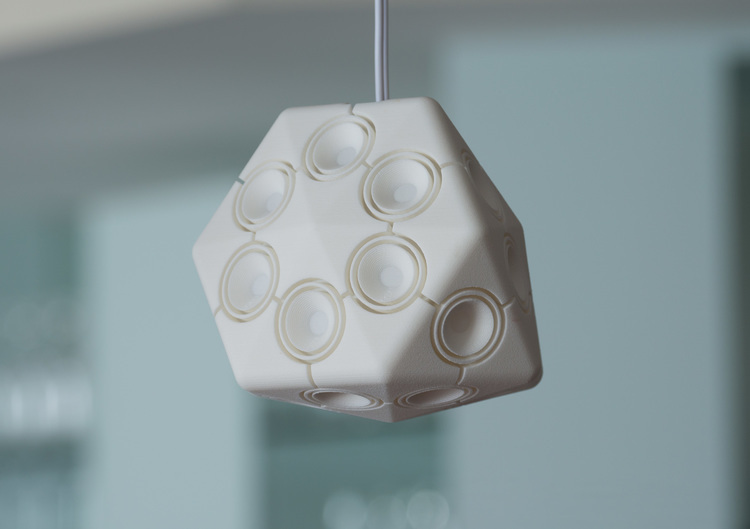 Without additional connectors the individual elements move mechanically. Doing this CASCADE reveals its full magnificence, drooping and fanned out, in flowing shapes like a waterfall. Design by Lionel T. Dean. 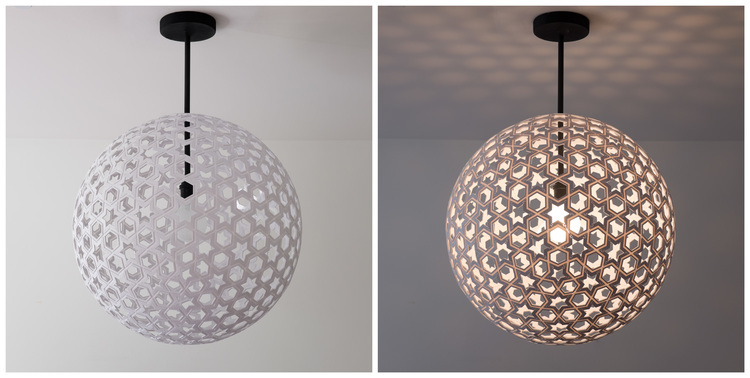 A connection between the inside and the outside, up and down, light and shadow, round and angular, plane and space. 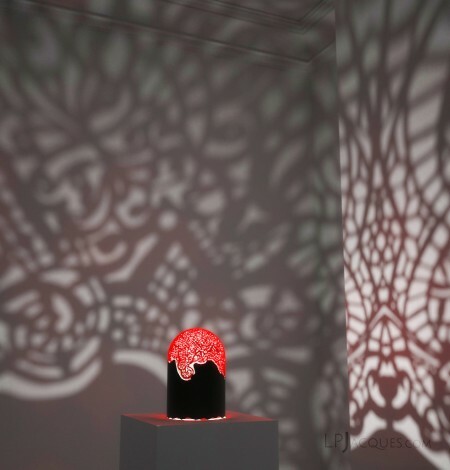 Let yourself be captivated by incredibly complex shadow plays and keep discovering new perspectives of this exclusive floor lamp. 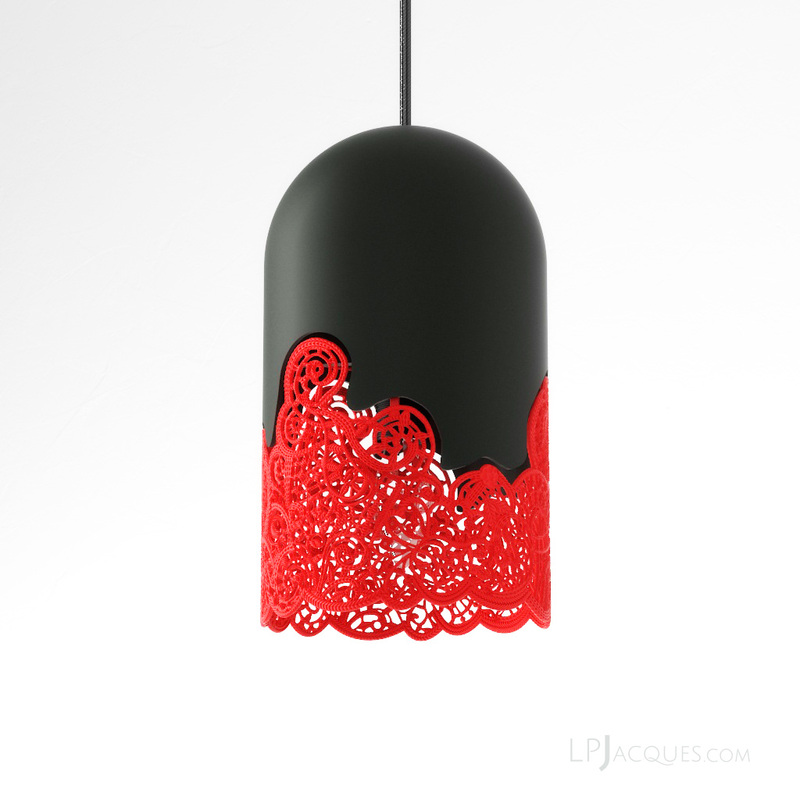 Design by Lisa Pittner. 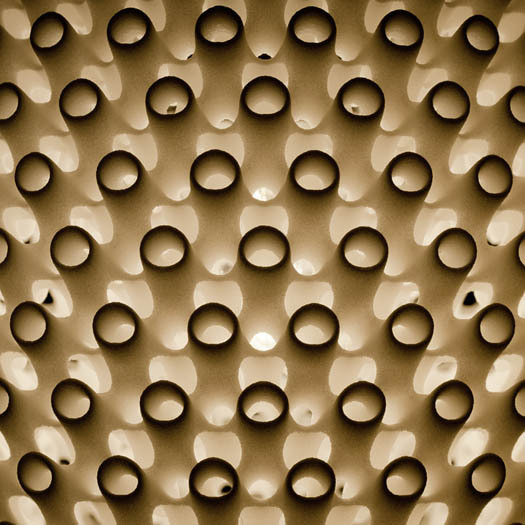 The spatial structure of the lantern ‘PORE TL’ consists of several layers of interconnected tubes shifted towards each other. 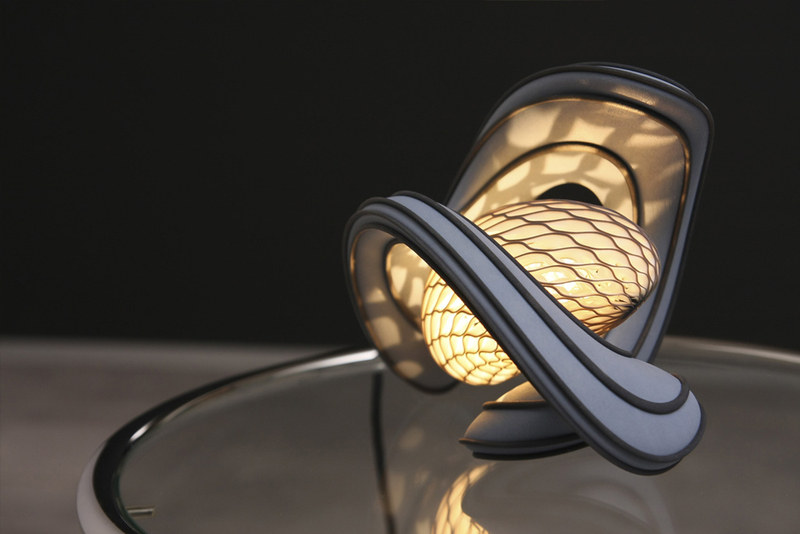 The flowing transitions and the changes of direction from convex to concave are reminiscent of mathematic minimal surfaces. 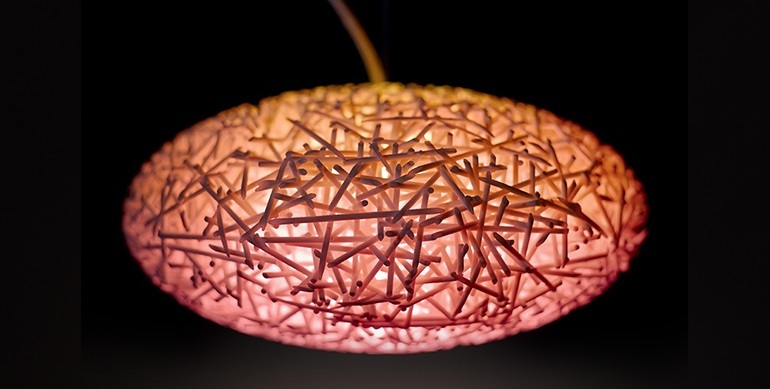 The impression of its structure however stays organic and one could associate it with flora or microorganisms. 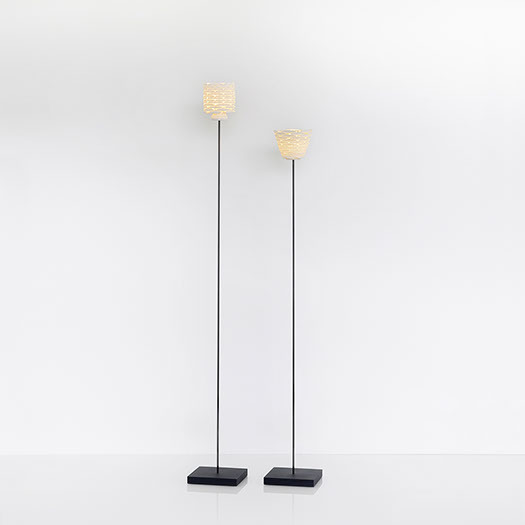 The complexity of this exclusive lantern contrasts aesthetically with the simplicity of the basic shape it describes. 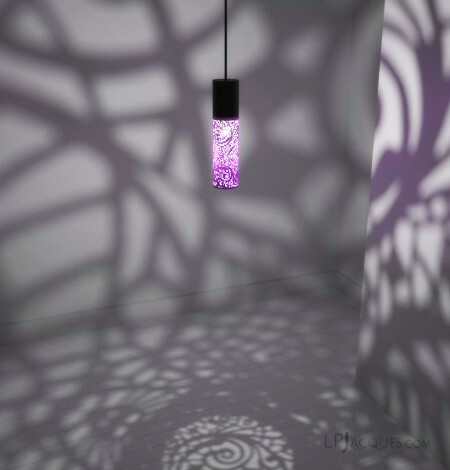 Due to the particular structure of its shade PORE TL offers you exciting ways to illuminate your surroundings in both indoor and outdoor environments. 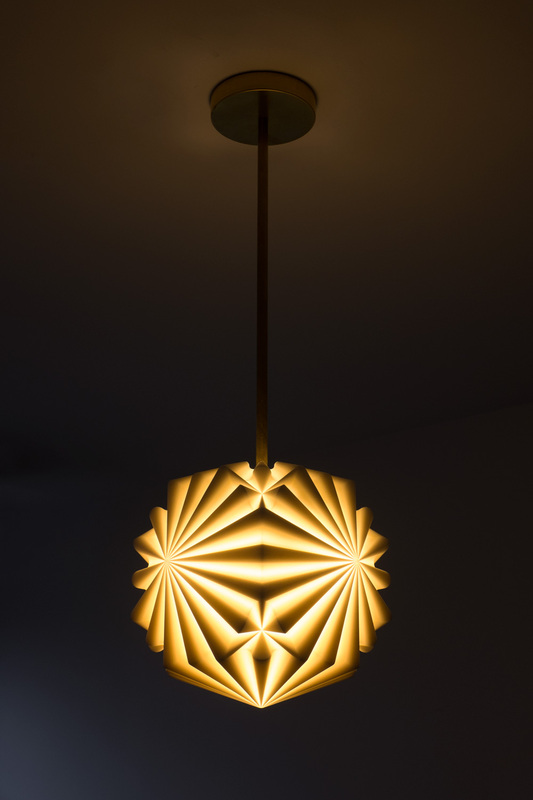 Design by Frank Kleemann. 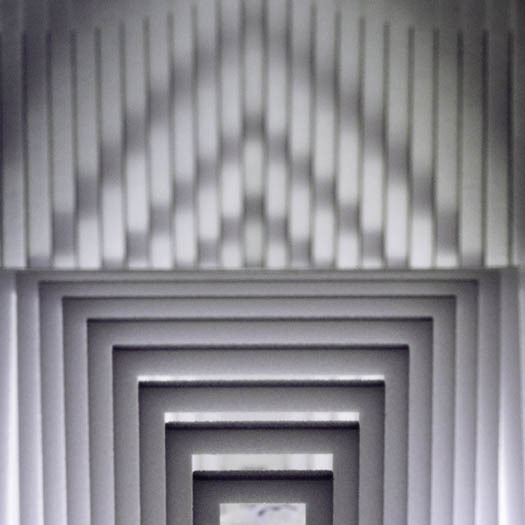 A connection between the inside and the outside, up and down, light and shadow, round and angular, plane and space. 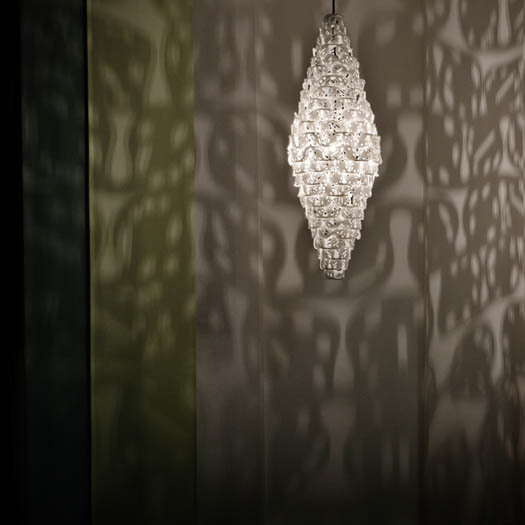 Let yourself be captivated by incredibly complex shadow plays and keep discovering new perspectives of this exclusive pendant luminaire. 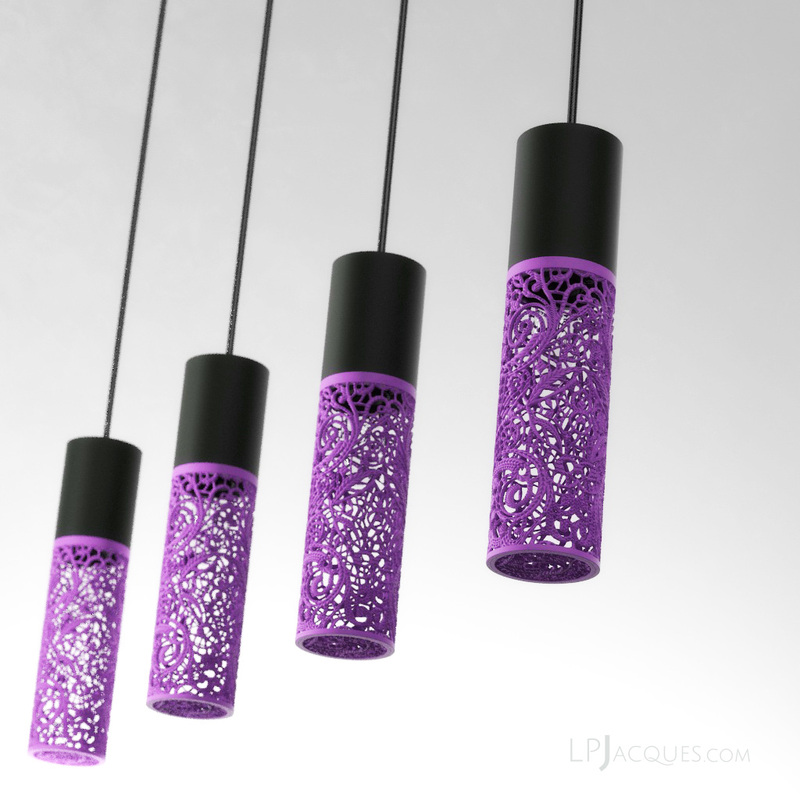 Design by Lisa Pittner. 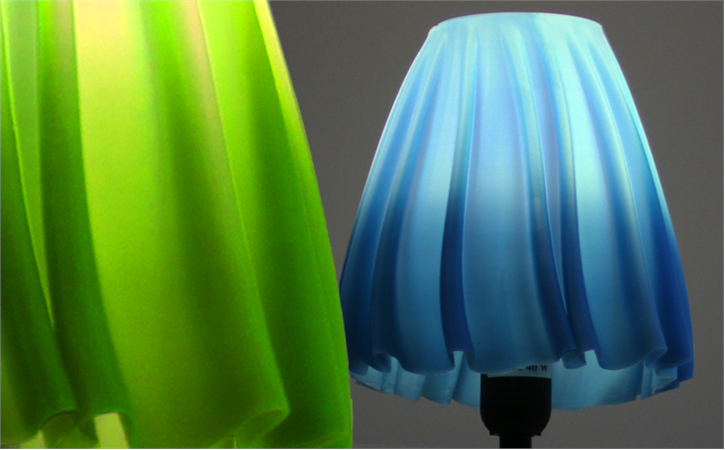 Put a Maglite LED 50 or a similar lamp into ‘LUM’ and what you get is a special ambient light. 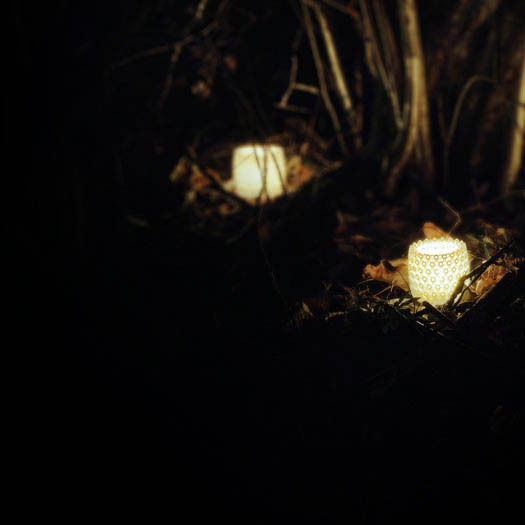 Lay it on your side table or hang it on the trees in your garden - you can decorate your environment. 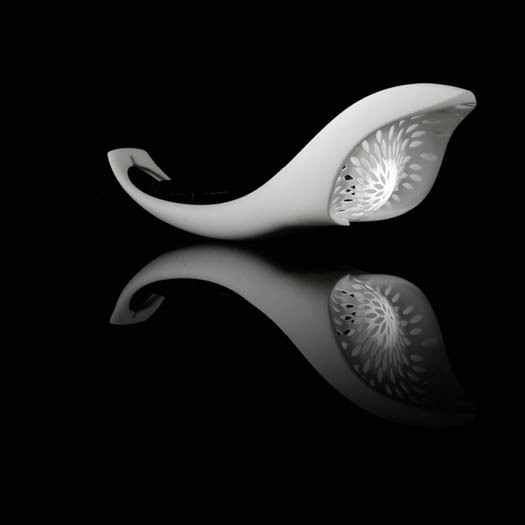 Its organic shape is comparable to the aesthetics of a flower. 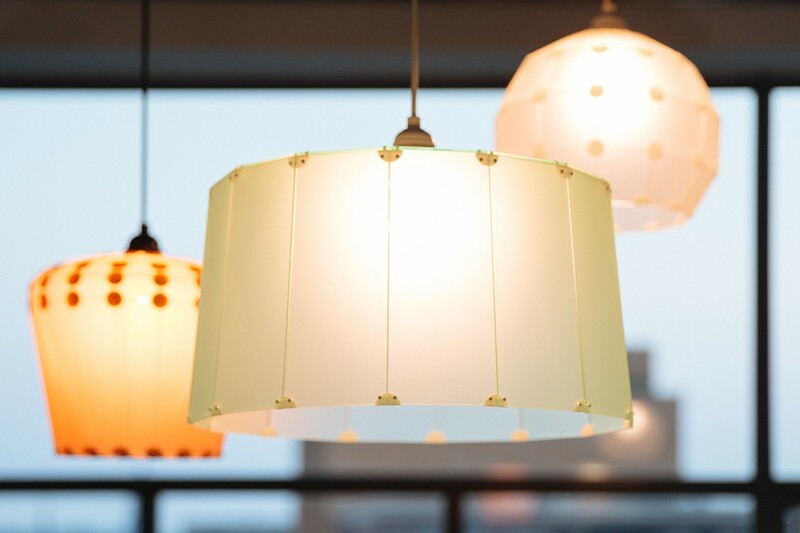 It shines from the inside out. 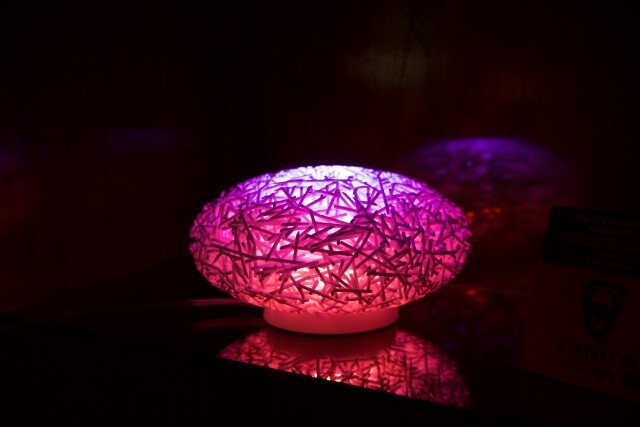 LUM is the new way to decorate your surroundings inside and outside. 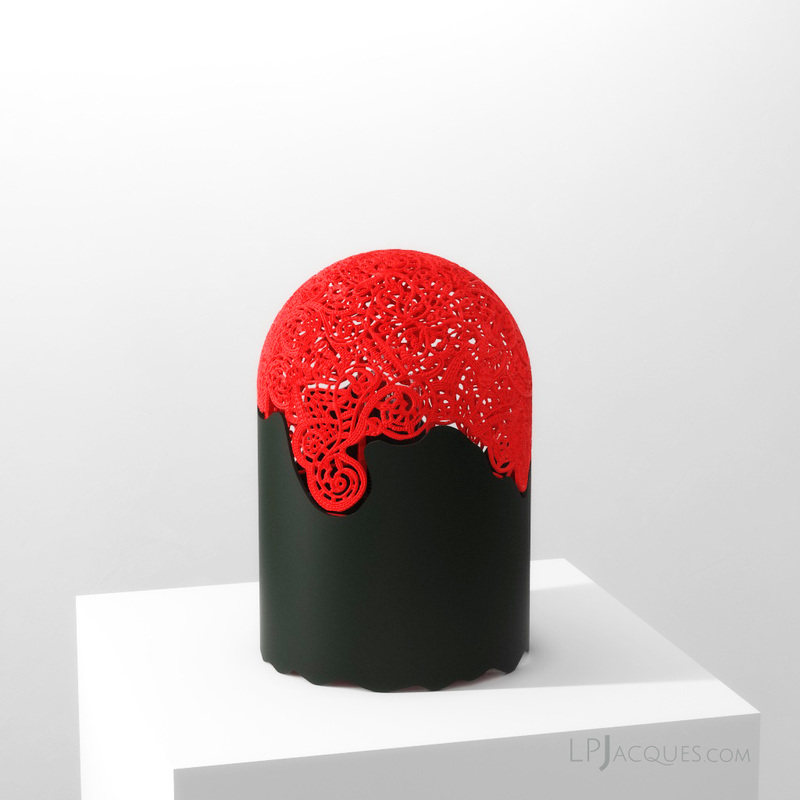 "LUM" was rewarded with the Fifth Prize in the Purmundus Challenge 2012. Design by Formherr. 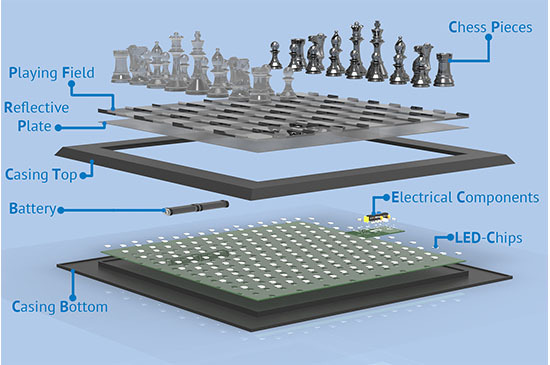 Student N. Hermes of Delft University of Technology created ‘CheckMate: an (electronic) interactive game of chess. 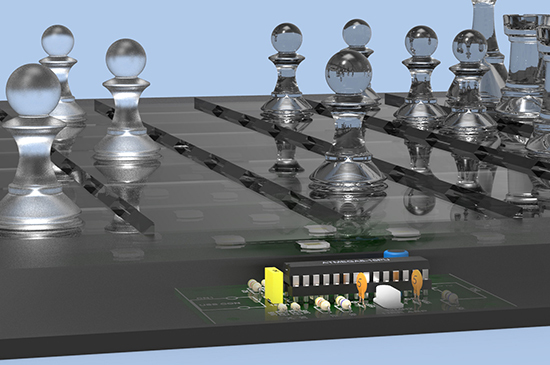 It makes use of LED-lights and light guides, to create an educational function which is added to your game of chess. 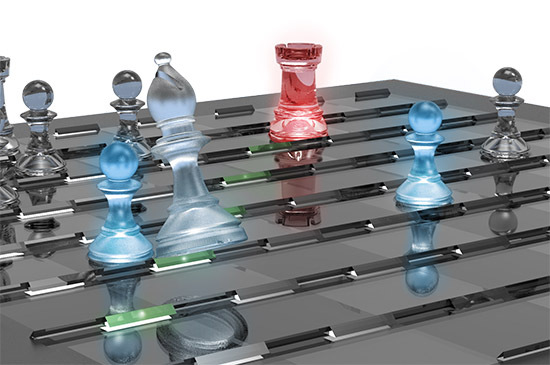 It allows starting chess players to improve themselves with ease. Advanced players can access a mode were advanced features will supplement the players strengths and weaknesses. 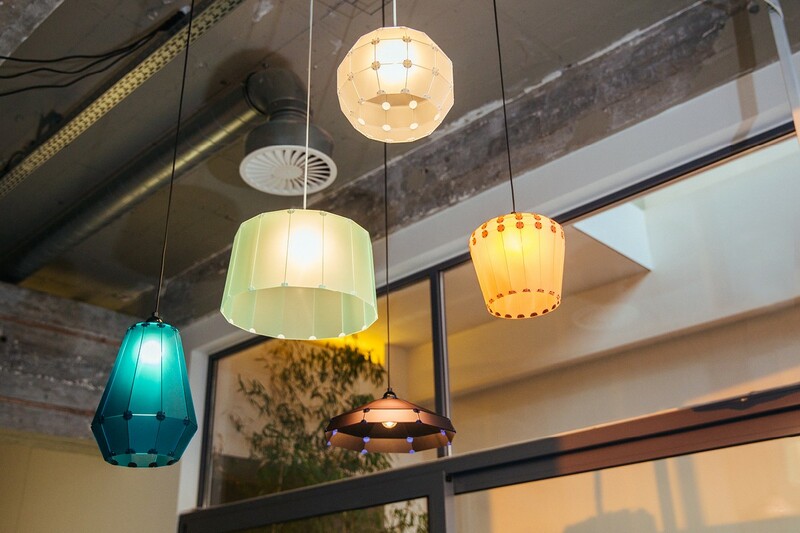 Looking for more Lighting Inspiration? 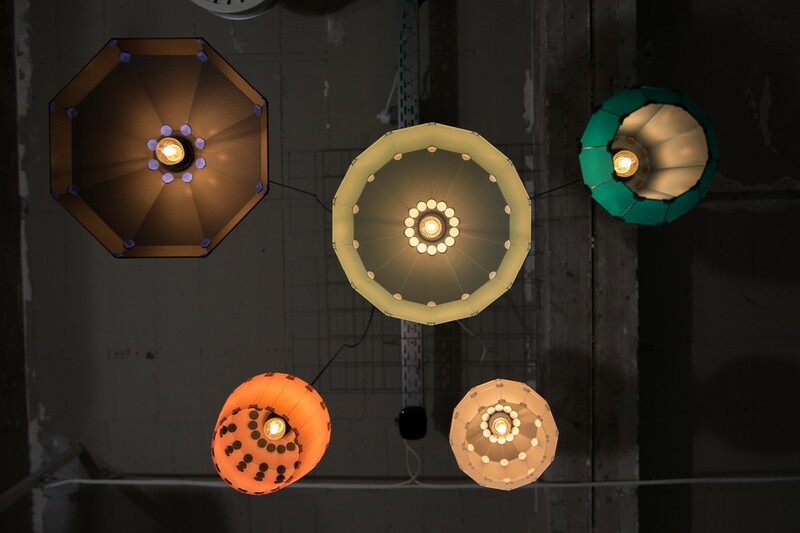 If you’re looking for more Lighting Inspiration, we kindly refer you also to the affiliated blog Inspiration.Lighting.